Some of you may remember BradMick for his work when he was running WCMDF. 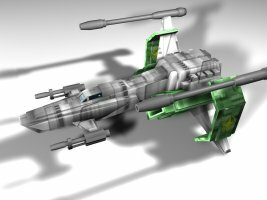 The good news is that he is still creating new models, and has recently added the Centurion to his collection of Privateer player ships. 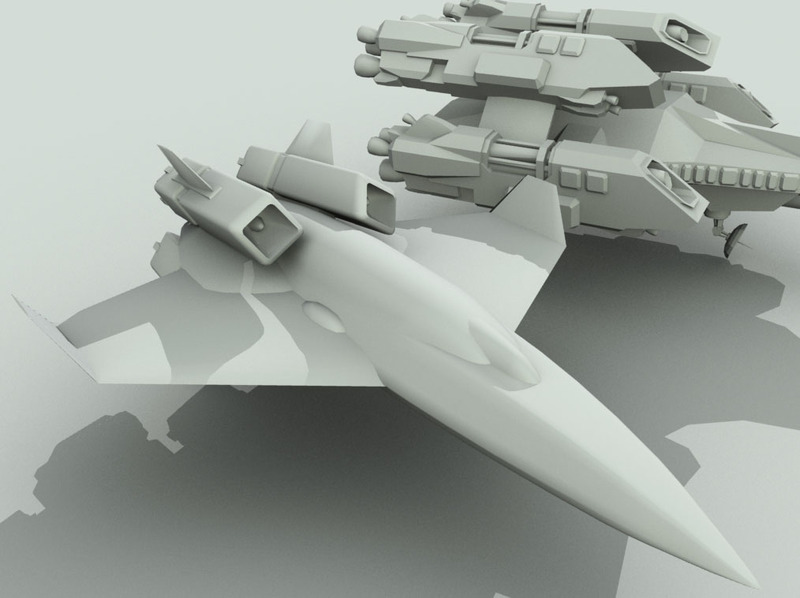 The models are going to be used with the WCU Vega Strike project and the Reckoning mod for Freelancer. You can see even more pictures of his work in this thread. Warthog has announced that is currently developing the sequel to Conquest: Frontier Wars. 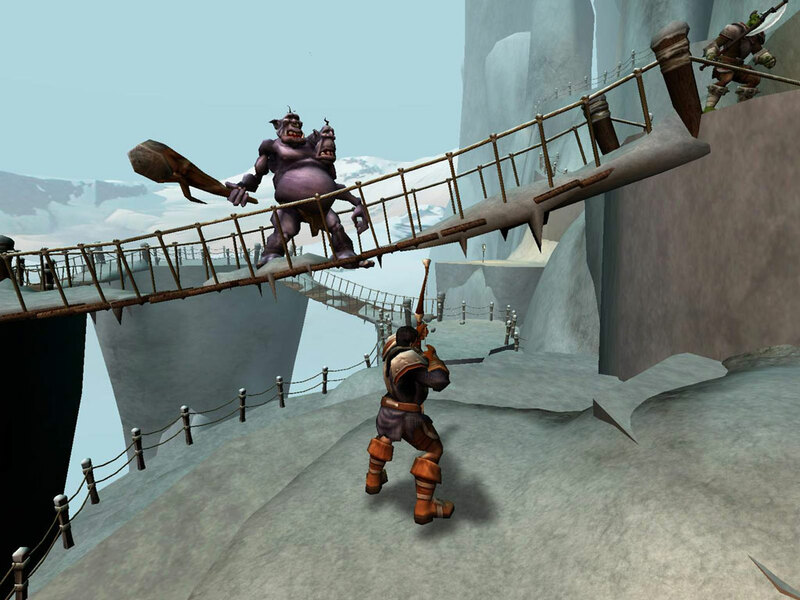 The original Conquest was developed by Digital Anvil, but the game was published by Ubisoft when Microsoft acquired DA and dropped the game. 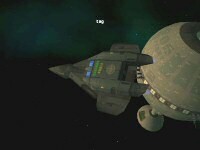 To further complicate matters, elements of Warthog in the United Kingdom developed Wing Commander Privateer 2, however Conquest is being developed by the Texas branch of Warthog. 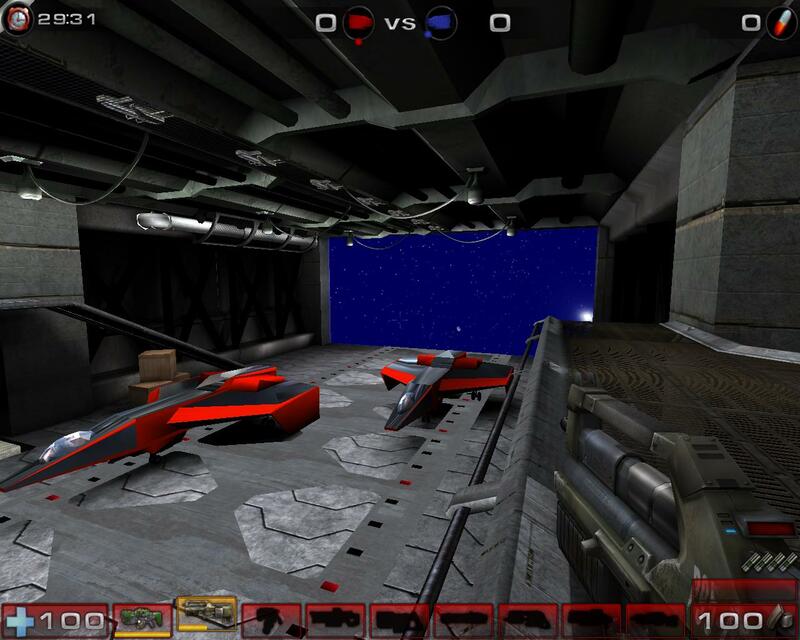 Warthog Texas is based out of Austin and is home to several Digital Anvil veterans such as Eric Peterson. Whew. 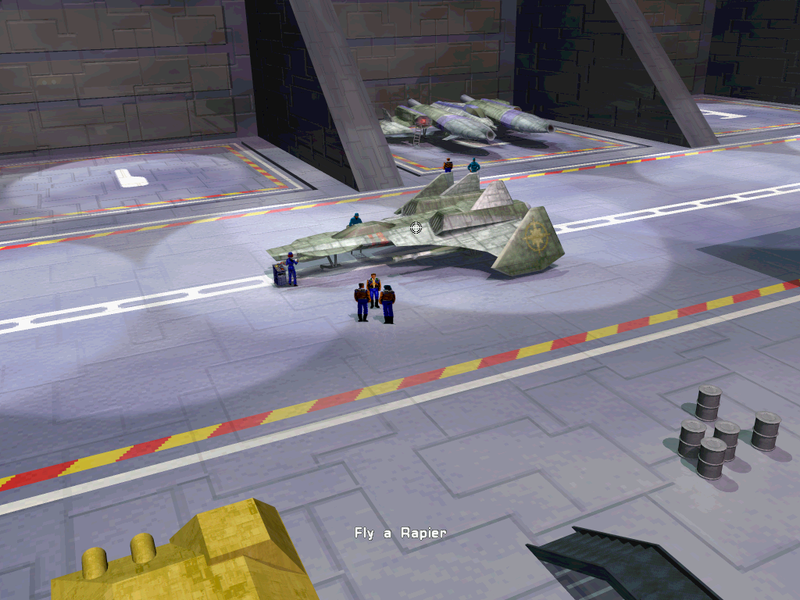 A few Wing Commander themed easter eggs made it into the original Conquest because of these links. 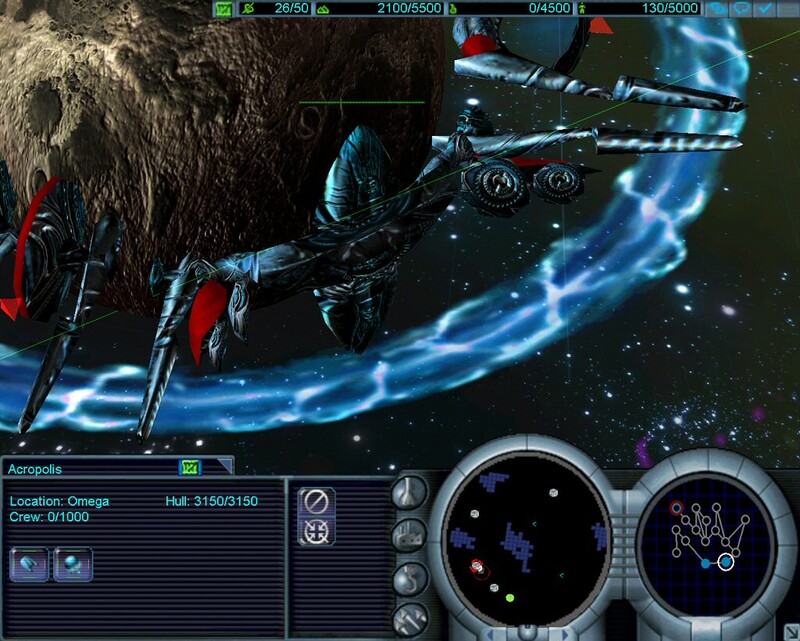 With that background out of the way, Conquest 2: The Vyrium Uprising is a real time strategy game set in space. 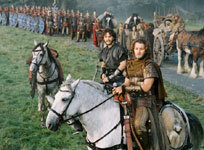 It will feature four races and have four campaigns. New dynamic special events, spaceborne creatures, hero characters and more will be added. In additional to standard RTS battles, Conquest 2's multiplayer will include capture the flag and objective based missions as well. A 26 meg trailer is available in Warthog's media section. 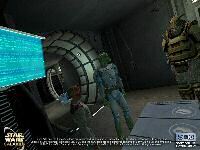 The game is expected for PC in the fall of 2005. TeamXBox has suggested an XBox version may also be in the works. 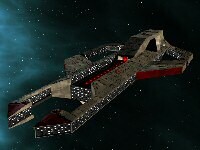 Following up on his neat Drayman work, Cyberion has put together a Hellcat for people to use. Not high on the poly count, so good for the fast rendering. :D Few details (nurnes) make it look very realistic from a distance. Originaly the model was created just to increase my modeling abilities. 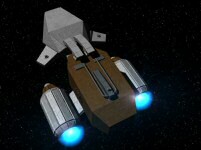 Currently it is being used in my personal freeware game based on the Wing Commander Universe. Neat. You can pick it up here. Who would have thought? A wedding and a birthday in the same year! ace turns exactly one year older than he was last year. Congratulations! 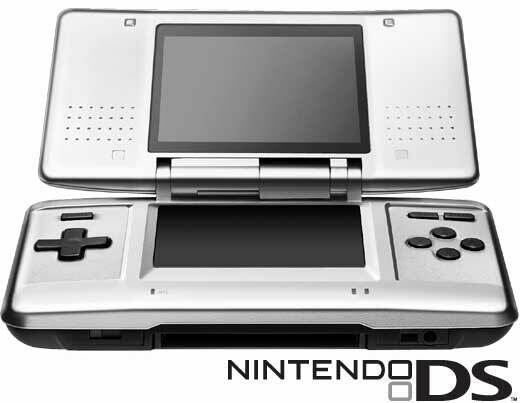 Nintendo has finalized the name and design of their next portable system. It's a bit sleeker than their E3 model and apparently a little more compact. 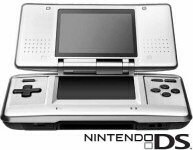 The price and release date are still undecided, but Nintendo has reiterated the unit will be on sale in the next several months. 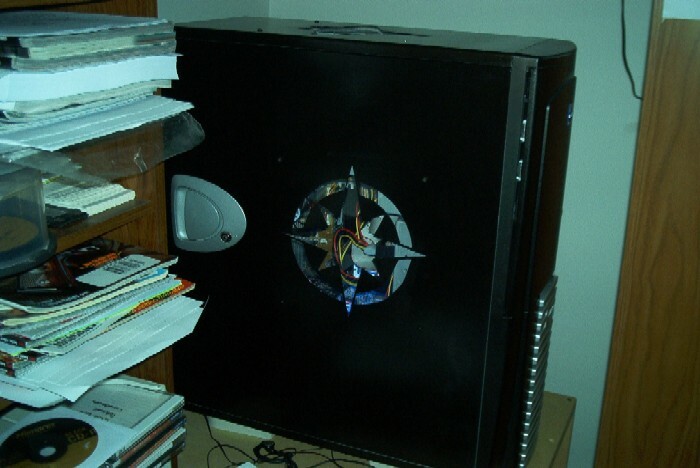 The system features two screens, with the bottom screen acting as a touch pad and second monitor. There's a microphone input for voice recognition, and wireless play is supported. Although new games will be in a separate format, older cartridges such as Prophecy Advance will continue to be supported. Cyberion has been working hard to prepare a 3D Drayman Transport for people to play with and include in various mods. He has created high detail and low polygon models to fit with different people's needs. Both are available in a pack here. What I'll be doing next I do not know... but it defenetly will be something from WC ships. So far I've done "Hellcat V" model and this "Drayman" model -> I have a huge list to do. Good luck in modeling and long live the WC series!!! The Drayman looks great. Go ahead and give a thanks to Cyberion if you use his model too. 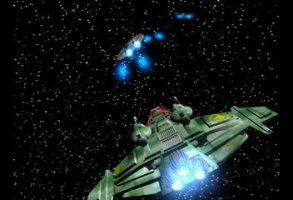 Several Crius members have started a discussion about the separate Wing Commander role playing games that have sprouted up this year. RPGs can be hard to implement and maintain, and Sangy, Expendable, and Slawter are trying to lend some of their experience to helping the RPG community. They have their own idea for a new project and are trying to gauge interest. 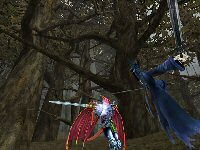 There are already other RPGs that need members, so this discussion might serve to bolster other projects' efforts instead. If this is a subject you're interested in, head on over to their thread here. With our experiances at WCGC we have accumulated a list of all the things we would like to see done and how they should be done correctly in a Wing Commander board based RP. 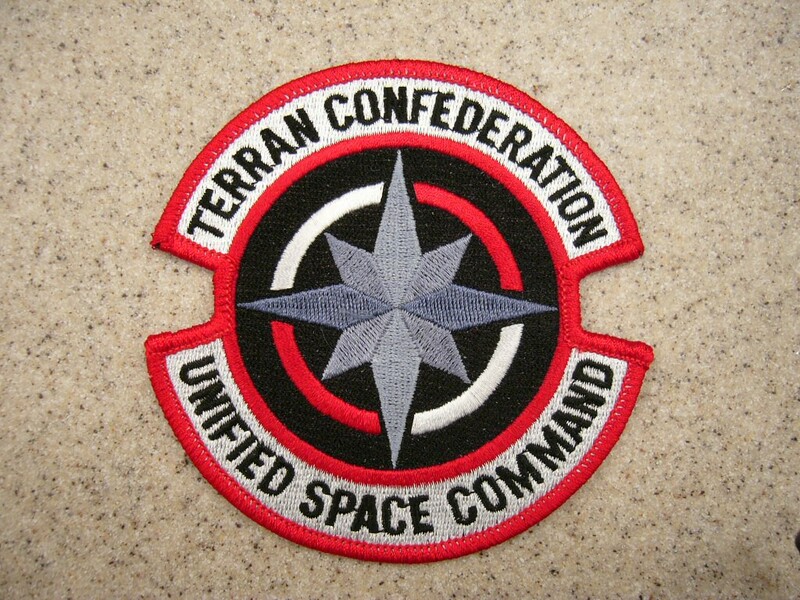 Now we are interested in developing this project into a working Role-Play system so that you, the Wing Commander fan can take his turn to become Admiral Tolwyn, defeating the Kilrathi above Earth, Jason Bondarevsky, sneaking behind Enemy Lines, and William Bainbridge, Defeating the bulk of the Kilrathi fleet at Vukar Tag. Hot on the heels of their latest quarterly profit announcement, Electronic Arts has announced two strategic partnerings this week. First up, EA is fully acquiring Criterion Software, which is currently finishing up Burnout 3 and developing the latest version of Renderware. The Renderware tools are used by a variety of companies to create games, and EA will now be in charge of licensing this technology to other companies. 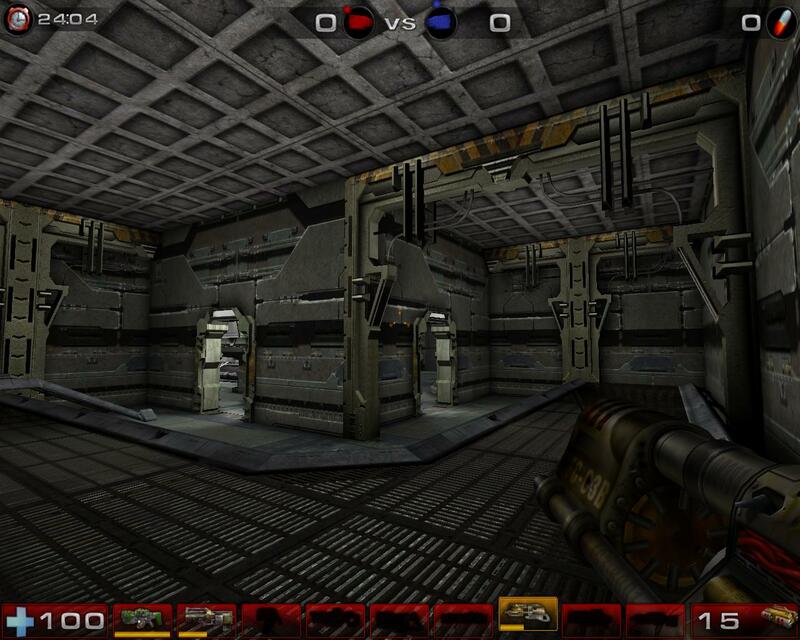 Over 500 games have used Criterion's tools to some extent in the past. EA is also entering a publishing deal with Crytek, creator of the popular Far Cry game. Together they will create an all new PC game in the near future. The CIC's birthday is more than just an excuse to give our visitors lots of prizes. It is also when we unveil brand new site content which have consumed many, many hours of our time. This year is no exception. On previous birthdays we have given you CIC Red, CIC Green, CIC Teal, and last year CIC Blue. This year we have a brand new CIC color for you, and while it'd spoil the surprise if I told you what it is, I can tell you that it contains nearly 500MB of files. Of course that's not all - we'll also be updating a number of our existing sections. Everyone can get involved in the birthday celebrations - each year we get several submissions from fans. Just look at what was sent in last year. We already have a few things from fans, but if you have something you'd like to contribute let us know! If you want to be among the first to get your hands on the birthday treats, join us on IRC for the birthday countdown. We officially start the party on August 10 at 7:00 pm Eastern US time (4:00 pm Pacific and 11:00 pm GMT). This year's online birthday will be on a Tuesday evening in North/South America and early Wednesday for those in Eastern Europe to Australia. If this is a new event for you, our annual birthday parties are held online on IRC in #Wingnut. 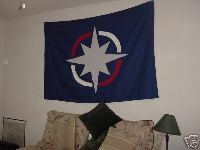 Details on joining can be found in our irc section here. 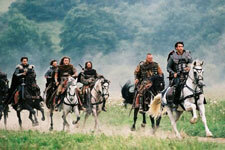 Clive Owen (Lev Arris in Privateer 2) trades his BMW for a horse in the new King Arthur movie. 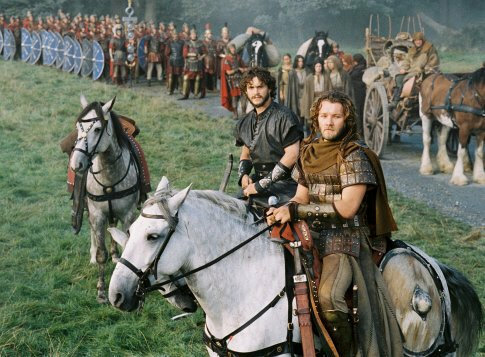 Owen portrays Artorius, the Roman commander in Britain, who must defend the northern border of the Empire from the invading Saxons. The Saxons were a large and brutal people who I can only assume to be the 5th century ancestors of present day English football fans. 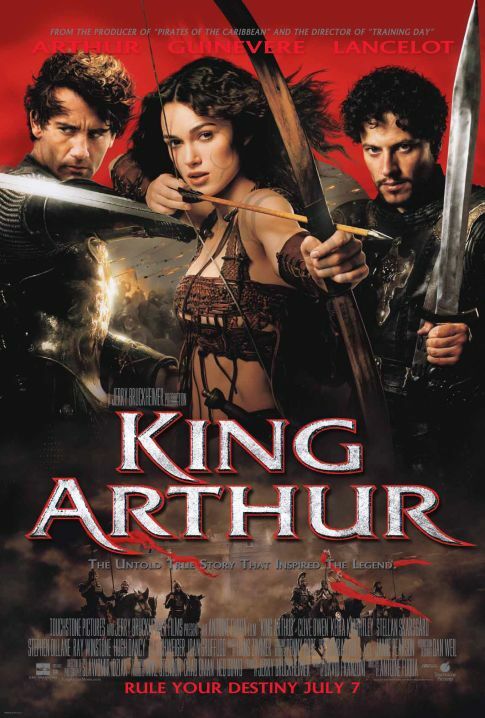 King Arthur will be in movie theatres around the world from July and August. The release date for your country can be found here. It seems that Tolwyn has decided that people have been kept in suspense long enough over how the WC Saga campaign is going to play out, so he has released a whole lot of details over on the forums. The demo/prologue is 5 missions. It's 50% instruction training and 50% combat related to the main plot. 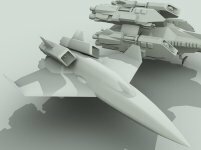 The reason why it's not a full-blown fight campaign (unlike the excellent Prologue ideas made by our friends in the Standoff team) is because while everyone here is assumed to be used to flying in the SO/WCP engine (and thus familiar with the keyboard controls and all of that), many people will not be familiar with the FS2 controls. That's why this prologue's main purpose is to get everyone up to speed. There's not much we can do in terms of branching due to the set FS2 engine programming. You either are on the main campaign path, or you are down the path of no-return. As for the main path, let's just say you aren't always winning. And for the path of no-return, it's when you try to defend Proxima and Earth (and lose in the process). The post is too long to quote here, so you can read it in its entirety in this thread. 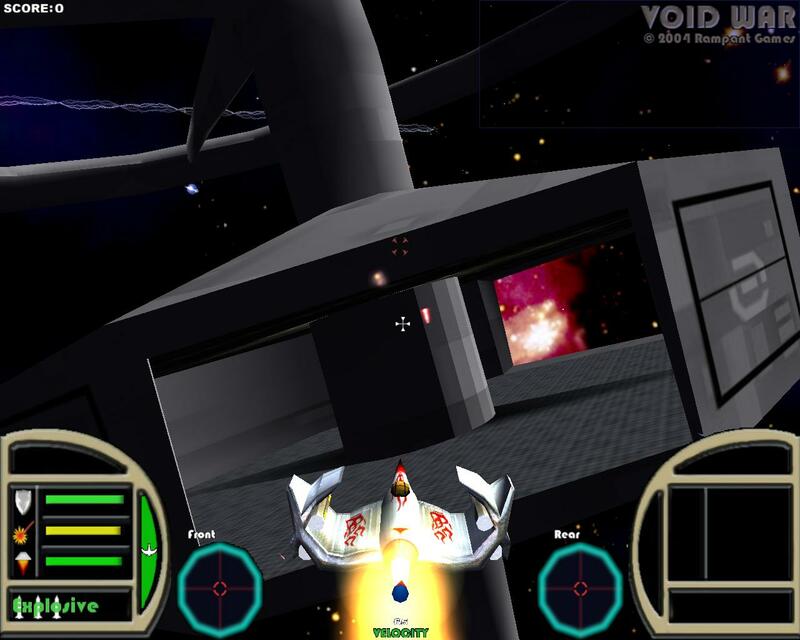 Pedro sent us another screenshot to let us know that his R-Type inspired Wing Commander shooter is still in development. 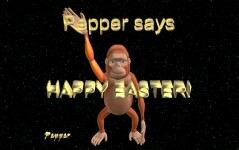 The original was a Java test program, but he has mostly transferred the game to C++. 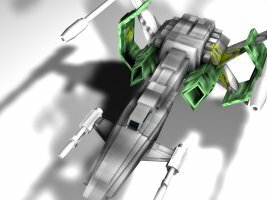 I'd like to request some help from 3D modellers. I need to to know how easy it is to convert multiple texture models into single texture models (so as to be compataible with md2), the alternative being to the WCP format (which has obvious mod benefits, but time is a factor). 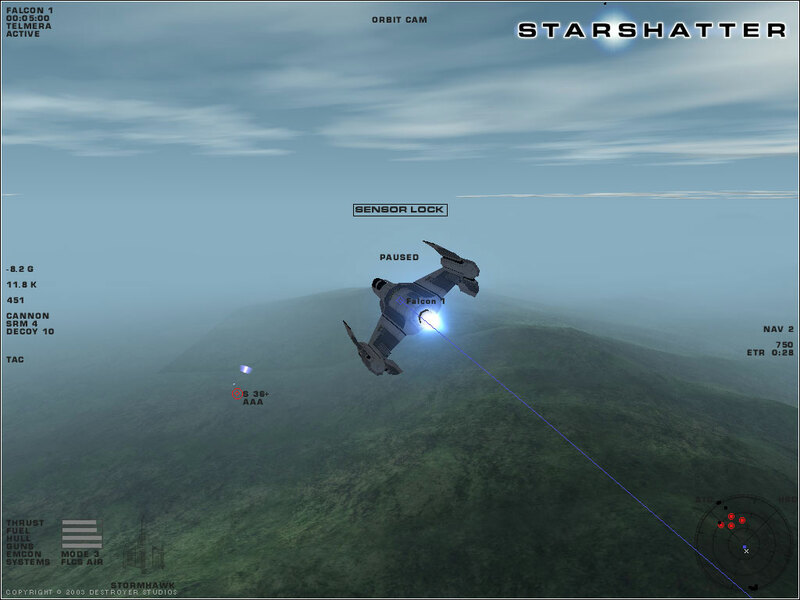 Also help with a few textures for special effects such as explosions, lasers, lens flares, etc. would be appreciated. Now would be a good time for special requests. The work is going slow because Pedro has a busy schedule, but click the "Discuss" link below to provide helpful feedback and requests. There are just two more weeks left in our summer trivia game. Week 4 begins today and the final week starts next week. Here are the new questions. Good luck! Question 7: Which race of creatures is led by the Teehyn Ree? Question 8: Which hive-like race multiplies when they find new fertile worlds, dies off when the resources are used up, and sends a small number of survivors to seek new untouched worlds thereafter? 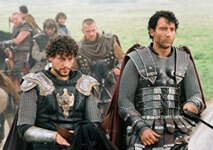 Bonus 7: Which race of primitive sentients inhabits Rostov III? Bonus 8: Which race consists of carbon-based arthropods that communicate through scents and pheromones? You can email your answers to trivia@wcnews.com or fill out the form. Electronic Arts has announced its results for fiscal Q1 2005. They had three new titles sell a million copies, and the slightly older Need For Speed Underground recorded its seven millionth sale. Q2 numbers will be even better, with NCAA Football and Madden numbers ranging 50-100% higher than last year's stellar totals. Net revenue for the first quarter was $432 million, up 22 percent as compared with $353 million for the fiscal quarter ended June 30, 2003. Sales were driven by Harry Potter and the Prisoner of Azkaban(TM), EA SPORTS(TM) Fight Night 2004 and UEFA Euro 2004, each reaching platinum status (over one million units sold) in the quarter... Net income for the quarter was $24 million, a 32 percent increase compared to the same period a year ago. Diluted earnings per share were $0.08 as compared with $0.06 for the prior year. The company is on track for $3.35 billion in total revenue this year. 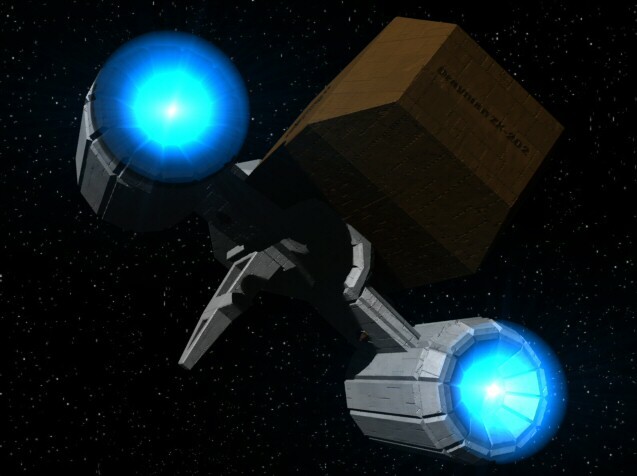 Fatcat has teased us with the first image of his upcoming Behemoth model. He is currently working on the gun ends and engine housings. 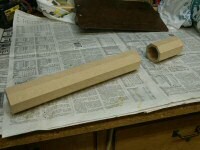 The design will be made mostly out of wood with a smooth fiberglass finish. Trivia Week 4 will be out tomorrow, so get your Week 3 answers in tonight! You can find the old questions and submit them in our Trivia area here. There will be just two more weeks in our summer trivia game! As you saw in the last chapter, the final battle of the long and bloody campaign to hold the line is beginning in earnest. 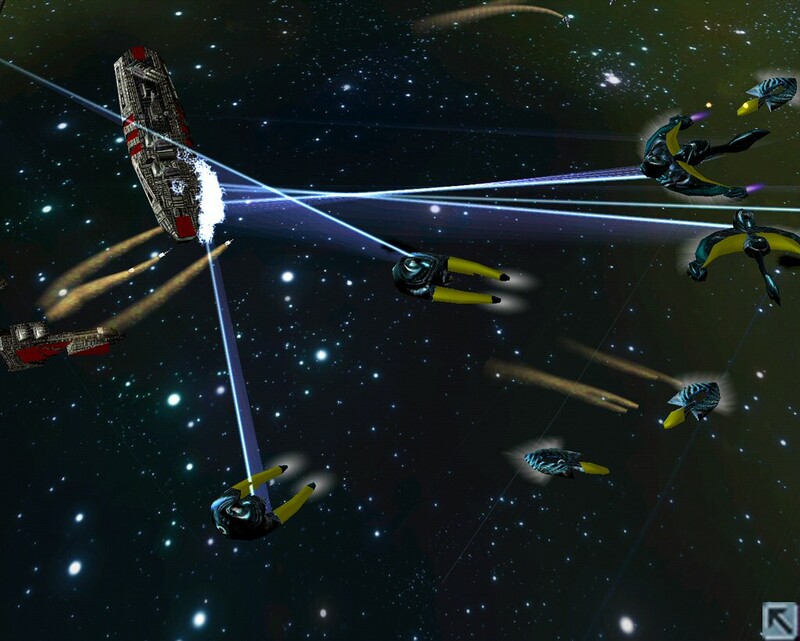 Battlegroups Rapier, Auriga and Aurora have joined forces to hit the incoming Nephilim fleet hard, launching a combined strike at an enemy dreadnaught and her escorts. 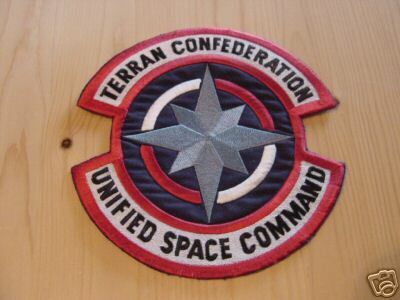 As before, this chapter is brought to you by the teamwork of Joe "Wraith" Guida, the Auriga writing team, and Shaun Rashid of the TCS Endeavour. Please send any and all comments to Joe at captpowell1@earthlink.net, and he'll pass them along to his fellow writers. Maj. Striker has completed a new 3d animation for Wing Commander fans to check out his latest models in action. It clocks in at three and a half minutes and 35 megs. It includes voices from the games to narrate. I really hope people eventually do turn something like this into a full story or movie someday. You can grab the clip here. News of Derek Smart's intent to acquire the Freespace license prompted us to put up an emergency poll last week. According to the results not everyone is familiar with the Freespace series, but many of our visitors are carefully optimistic. 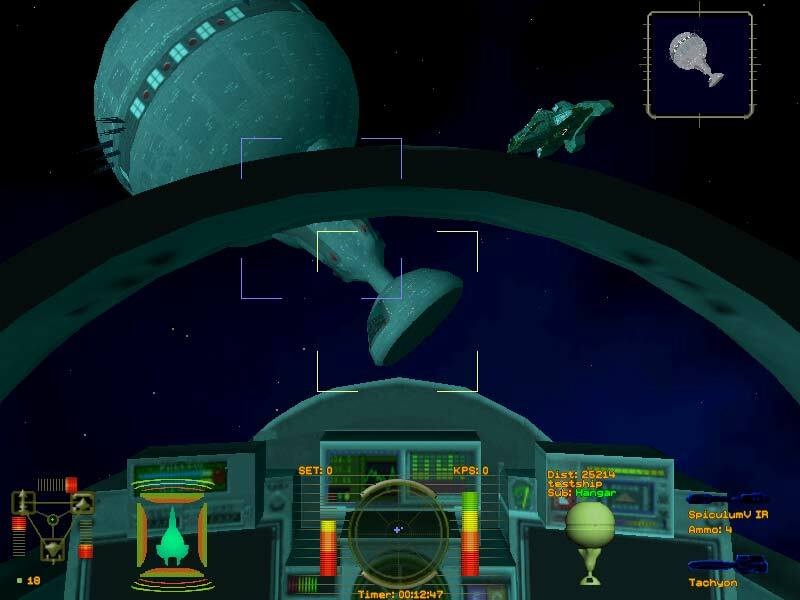 Our new poll asks what your favorite non-Wing Commander space-sim series is. Poll suggestions are always welcome and can be sent to news@wcnews.com. 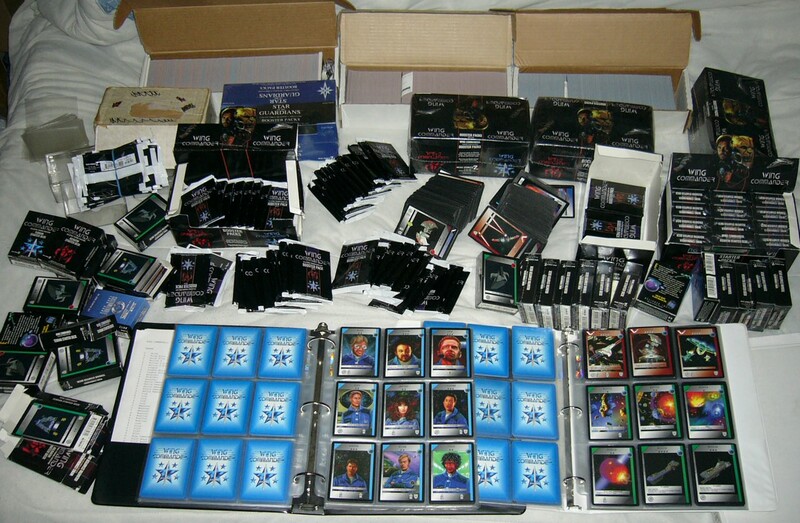 I've finally gotten a little time to clean up and organize some of my Wing Commander Customizable Card Game cards. 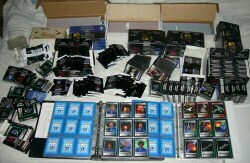 Over the years a number of people have expressed interest in trading a few cards to complete their sets. I suppose we're ready to do that now. Completing a set of the CCG is like one of those things you put on the list of things you must do before you die, so we're happy to help. Go ahead and send me an email if you are trying to complete your set. Forums poster Maj. Striker has revisited his Raptor model and has tweaked it, adding better guns and making a few cosmetic changes. He has even pulled off the improvements while drastically reducing the polygon count, reducing the model from 10,000 polygons to 2900, yet it still looks great! The textures aren't quite aligned right in the first picture but that has since been fixed for the second picture. You can comment on his latest work in this thread. Here's something that you probably haven't seen before. Unless you live in France, that is. I don't know about you, but I prefer this French WC movie poster to the US one. The question is: If this is the French WC movie poster, then what is this one that we reported on three years ago? I wonder which was actually used. When we moved servers a few months ago we put our IRC server on a different machine than the rest of the site, which broke our Java client. Well now we've got around to fixing it! So if you want to drop by #WingNut (and you should) you can now do so even if you can't install a real client for some reason. To get on IRC without having to install things, just click the chat link on the left menu, click the IRC Chat link at the top of the forums, or just click here. Now there's even less excuse for missing the birthday! A week ago we reported that Starshatter has been released. 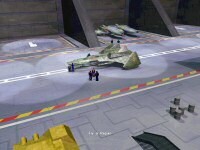 The guys at riha-games.com are already working on a Wing Commander mod. A number of fighters, capital ships and starbases have been imported and they hope to have an initial Alpha version available for download soon. 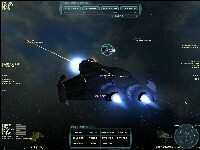 At the moment, mod support is limited to creating new ship designs, new weapons effects, and new custom missions. When the game is complete, you will be able to create Total Conversion packages that replace the GUI art, fonts, HUD, and campaign data with custom content. Have you ever wanted to put the CIC headlines on your own website or weblog? Now you can. An RSS 2.0 formatted file is available for syndication here. You can also add us to your favorite news aggregator, such as RSS Owl, as shown below. 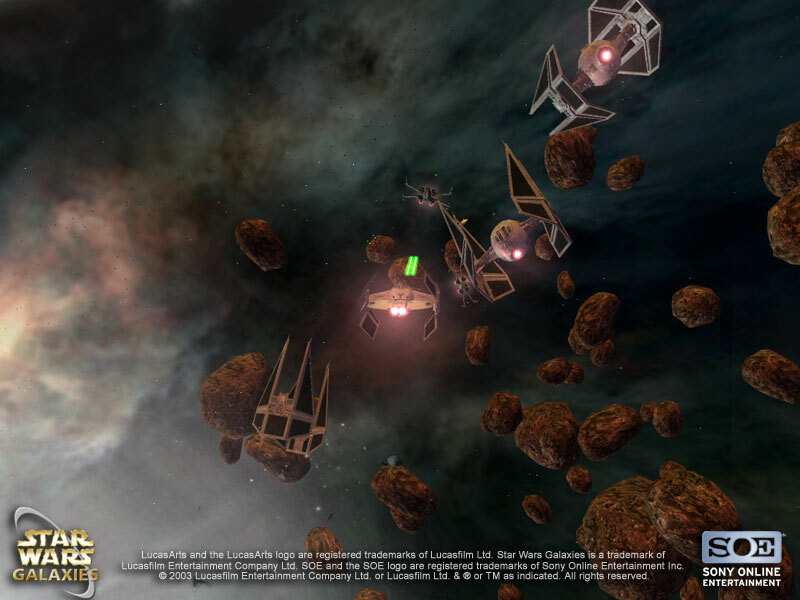 Lenny Raposo has been hard at work on creating a web interface for a Wing Commander role playing game. 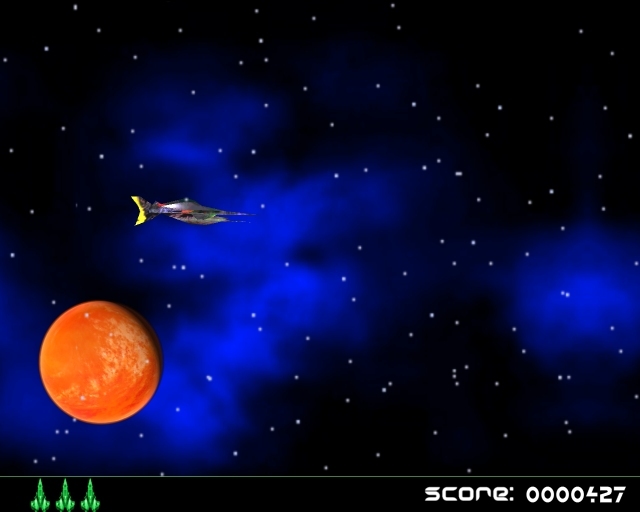 He has been getting experience in implementing a project like this in a Star Trek environment here. 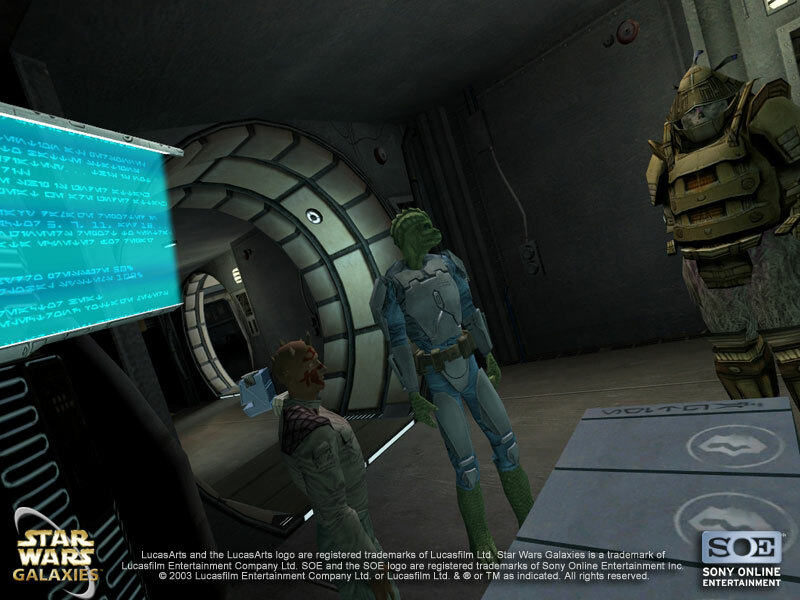 The completed game will allow people to sign up and play characters in space. 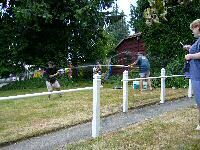 There will be a wide variety of tasks available to occupy the time and interact with others. A glimpse at the interface will give you an idea what features will be available. The team is now deciding the game's specifics. 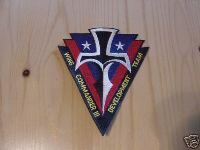 Also wanted to get some feed back from the Wing Commander community at WC CIC. Like what era would they like the game to take place in? 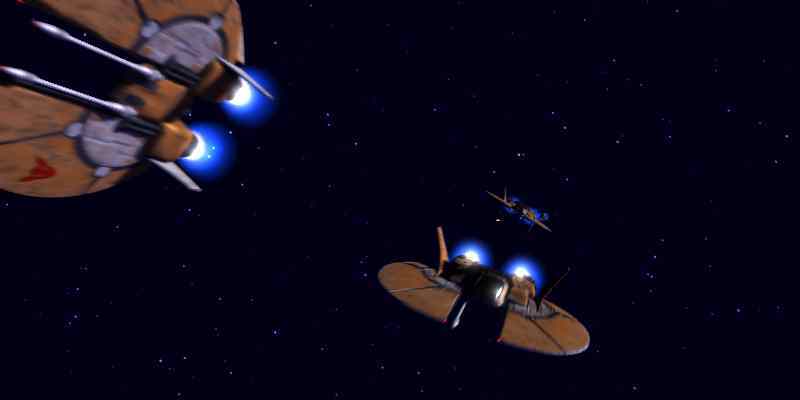 Should it be a new chapter in the Wing Commander Saga? What races would players like to see in the game? What ship and weapons or technology would they like available to them? Any input at this point in time would be greatly appreciated. You can click the Discuss link at the bottom of this update to provide feedback. There should be a website for the project up soon with more information. 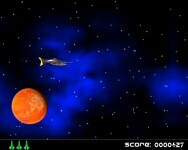 This reminds me of several old shareware science fiction games I'd play back in the day. Going up against actual people in this environment would be pretty neat. 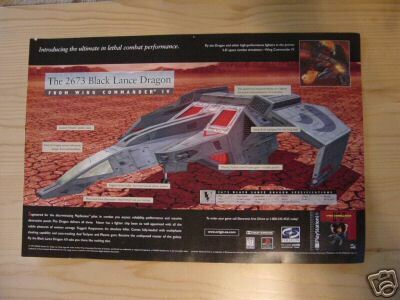 Sundance recently noticed the lack of dedicated Elizabeth Barondes (Panther from Wing Commander 4) destinations on the web and went out to fix this problem. His new Elizabeth Barondes fan site is open for business. It has a lot of shots, screens and scans from various projects and information on her life and career. There probably are some people visiting your site who might be interested in Elizabeth Barondes. I have no idea if there are or has been any photos being spread amongst the WC community, but at least I haven't seen many photos of her online, until now. And who knows, maybe some people visiting your site might have some photos, info or news what I'm missing. IMDB doesn't even have a picture for her, so this is pretty neat. Only other Panther site that comes up off the top of my head is Rambo's. You can visit Sundance's new site here. There are just three weeks to go until the CIC's Sixth Birthday! We're working hard to bring you some exciting new things this year. 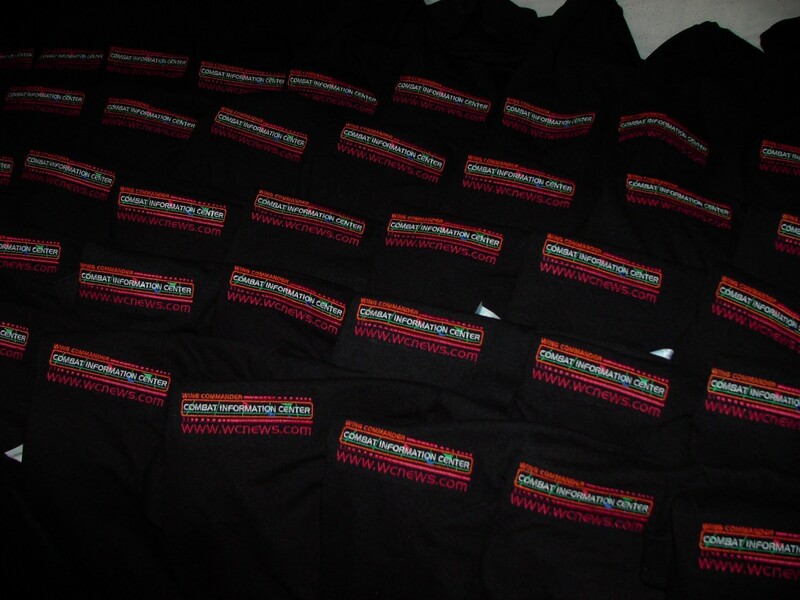 In the mean time, I thought I'd show you some of the prizes we have lined up for this year. Door prizes this year will include Game Boy Advances and copies of Prophecy Advance, CIC polo shirts, CIC playing cards, CIC pens, copies of the WC movie, WC4 DVDs, WC movie soundtracks, WC movie posters, WC movie shirts, WC movie action figures, WC novels and a Tom Wilson autographed Maniac photo. The exact quantities of each item haven't been nailed down yet, and we'll probably find a few more neat items along the way. This year's online birthday will be on a Tuesday evening in North/South America and early Wednesday for those in Eastern Europe to Australia. If this is a new event for you, our annual birthday parties are held online on irc in #Wingnut. Details on joining can be found in our irc section here. Feel free to stop by any time to get situated or hang out. We officially start the party on August 10 at 7:00 pm Eastern US time (4:00 pm Pacific and 11:00 pm GMT). There will be dozens and dozens of excited WC fans hanging out together, plenty of cool prizes and great new things to see. I hope you can join us. Trivia Week 3 Questions are now out for our special summer trivia game. The answers to Weeks 1 and 2 are up, and there is now a scoreboard to see how you rate. You have one week to answer the following questions. Question 5: What fighter's yaw rate is enhanced by a horizontally rotating thrust pod? 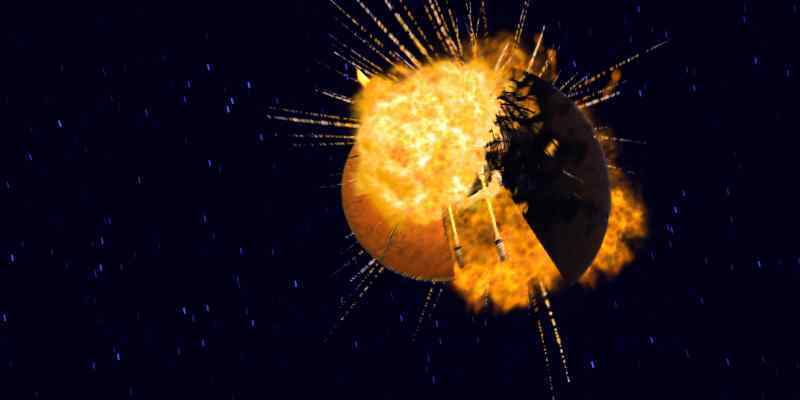 Question 6: What class of ship seems to have been the primary battleship for Kilrathi inter-clan civil war for at least a centruy before contact with humanity? Bonus 5: What is one type of ship that would mount Mark 33 engines? 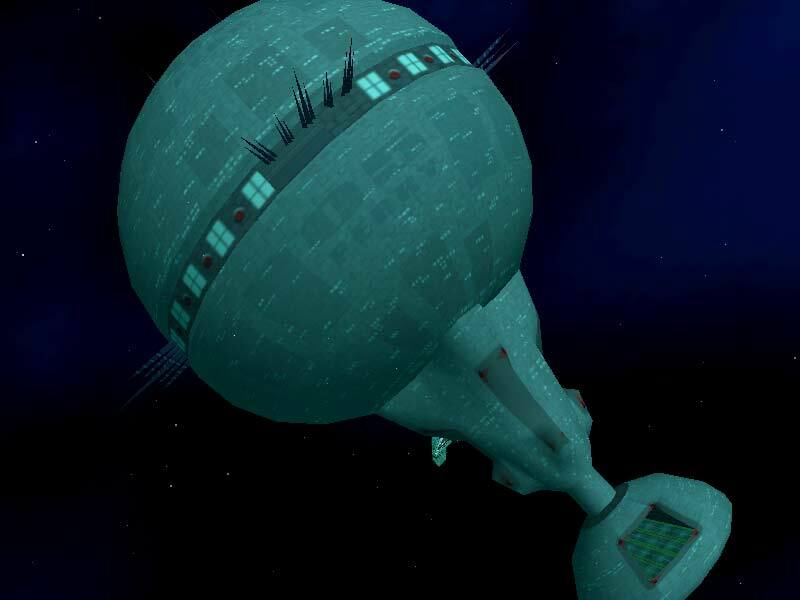 Bonus 6: The Kilrathi scientist Hajjnah gave the Confederation blueprints detailing what ship when he defected? 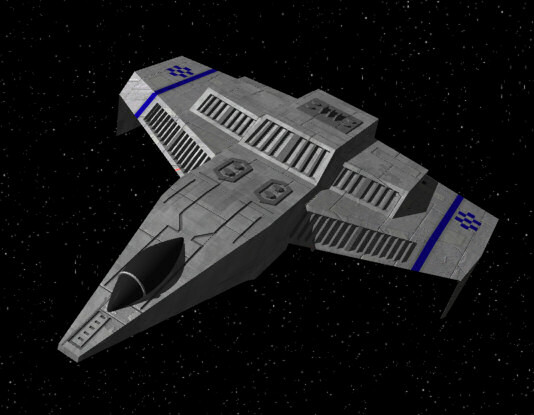 Wing Commander veterans might recall the TCS Paradigm made its debut in the Origin FX Screensaver shortly after Wing Commander Privateer was released. It's a cool ship that we never learn much about. Ever wonder what happens when you type "TCS Paradigm" into Google and hit the "I'm Feelin' Lucky" button? Well, Bob did and he got some interesting results. Is TCS always possible? I think I have discovered the very interestingly wrong thing about this question. In order to ask the question, one must have come to understand what TCS means (otherwise, the complex project of taking children seriously would not be presenting itself as a problem to you), and once one has come to such an understanding, it is no longer possible not to take children seriously. 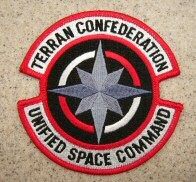 "The TCS Paradigm Shift" would make a great title for something Wing Commander related. TanGO, a member of the Standoff team, has released a few images of the work he's done in the Secret Ops engine. 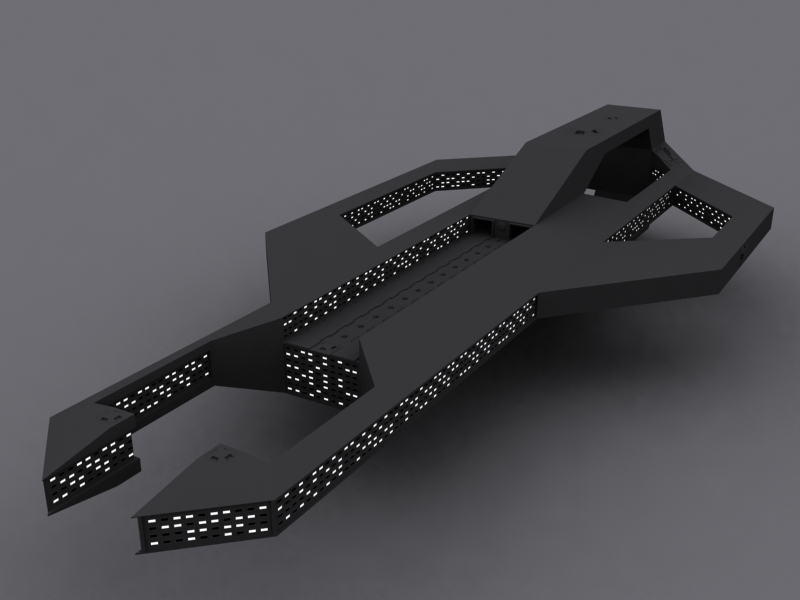 He has darkened up the Black Panther to make it more stealthy and incorporated a Perry style naval base. Although in the long term he hopes to incorporate this stuff into a mod, for now it's just for fun. Feedback is appreciated at Crius here. Trivia Week 3 will be out early tomorrow morning, so your answers for Week 2 are due tonight. Because of the email glitch last week, there has been an extension for Week 1 answers until today as well. 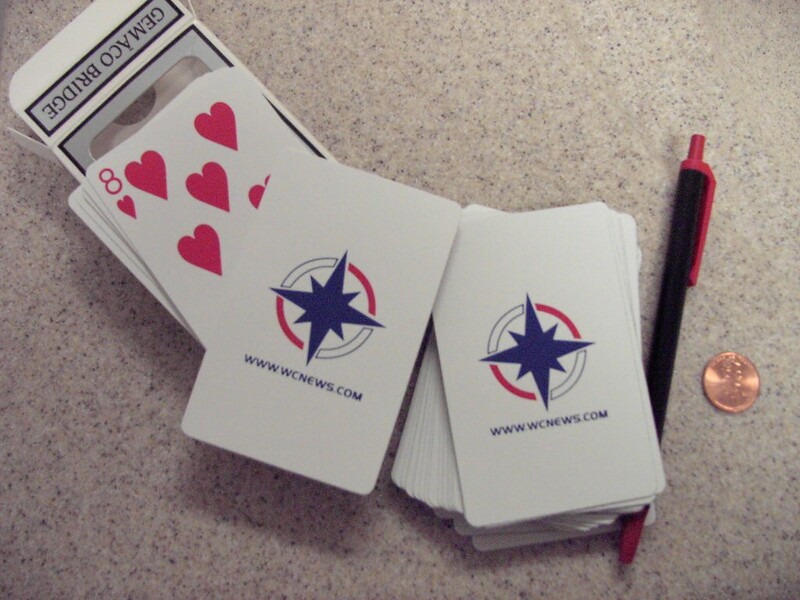 The top winners will get a neat deck of CIC playing cards. Every point counts, so submit your answers now if you haven't done so already. Question 1: Geoffrey Tolwyn headed what agency circa 2673? 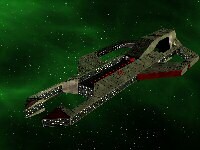 Question 2: What organisation provided entertainment for the crew of the Tiger's Claw on 2654.140? Bonus 1: What organisation "offers the most challenging missions and a premium compensation plan?" Bonus 2: What organisation participated in a 'restorative action' on Veratek in the 2660s? For the past four months, Dishwasher has kindly been hosting our high quality WCA DivXs. He now has a webpage up listing all of the available episodes. If the episodes ever change location or there is a problem with the server it should be easy to notify people via that page. Dishwasher has a download limit of 20GB per week, so if you find yourself unable to download just try again the next week. You can find his new webpage here. Earlier today the CIC Forums hit the big 200,000 posts mark. Sadly this doesn't include the posts which were made on our old boards which we ran pre-year 2000, but it's still a nice number to reach. In case you're wondering, the 200,000th post was this one. Our poll archive is becoming quite lengthy. If you have a good idea for a CIC poll that we haven't used before, please let us know at news@wcnews.com. Tolwyn from WC Saga has announced that a WC Saga demo is in the works. Shortly before and after its released, they're depending on interested fans to use the demo to find bugs and make the game more playable. You can visit our WC Saga forums to help the Saga team on this project. Yes, there is a full-blown demo in the works. 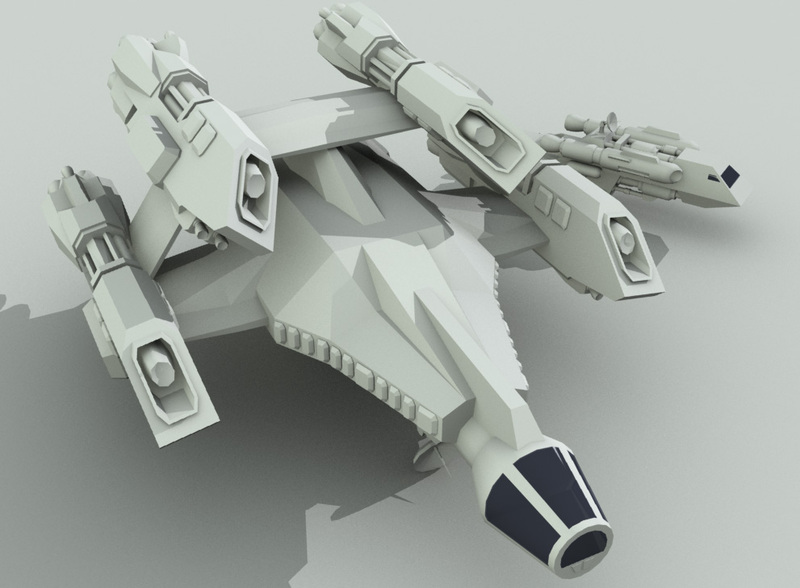 Not every ship/fighter in the full Saga release will be incorporated into the demo, nor will every music track. You'll only get a sample. There are good reasons for a demo release other than to satiate the desire for a fusion of WC and FS. First of all, it would provide a much wider base for finding bugs and being able to discover which system specs run the mod well. Some people may need to save up to upgrade their machines in order to run the mod, and it would be a great courtesy to let them know beforehand that such an upgrade would be advisable. Second, it would also help to generate fan feedback for fine tuning the actual product before its release. Nothing is more dissapointing than waiting for a game to come out, and then when you finally get it, it's fun is greatly diminished due to a multitude of bugs (this is what happened with X2: The Threat). In order to stick to time table the team could use some help from the community. Any kind of help is appreciated. 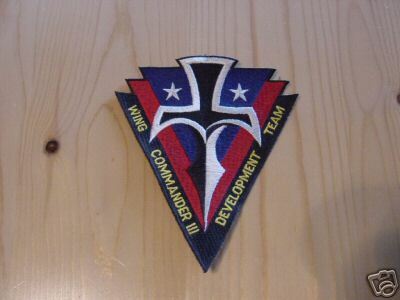 Head straight to WCS forums, take your chance to become a member of the Wing Commander Saga. The team is looking forward to hear from you soon. EA has officially announced the next UO expansion, one of two secret Ultima projects that UXO was canceled in favor of. 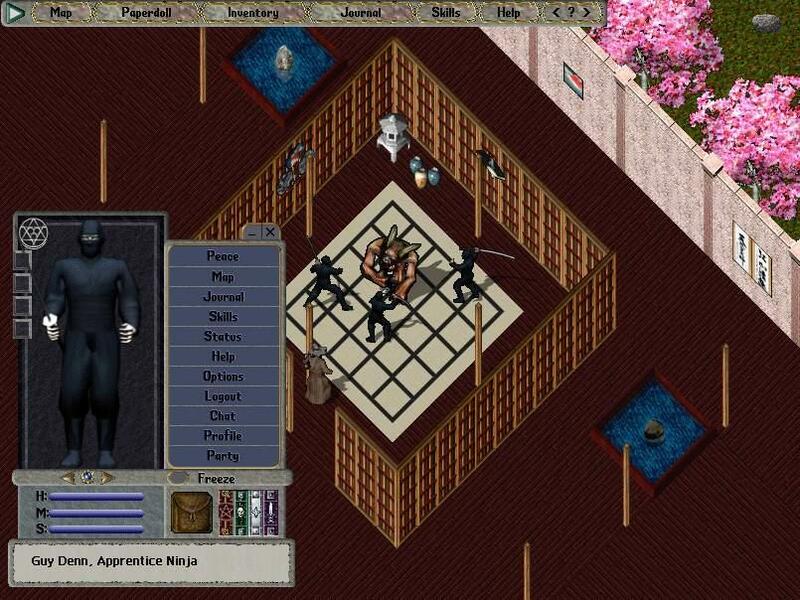 Samurai Empires adds Samurai and Ninja occupations to the game and includes a variety of Japanese inspired monsters, demons and other creatures. You can tell from the screenshots below that the game appears somewhat dated today, but it's somewhat amazing that it's still going strong after seven years. That's a time period equal to the gap between Wing Commander 1 and Prophecy! Traveling around a mysterious Asian environment filled with exotic beasts, expansive dungeons and scenic housing areas, players can strive to become a fierce Samurai, dedicated to the art of Bushido and focused on learning new physical combat abilities. These skills include Lightening Strike, a ferocious and fast single attack with a 50 percent hit bonus; Whirlwind, where a Samurai's powers increase as the number of enemies he's fighting multiply; and Honorable Execution, which is an attempt to eliminate an enemy with a single attack. 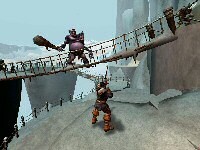 Players also have the choice of joining the elite ranks of the Ninja, where they will concentrate on magical combat and stealth. 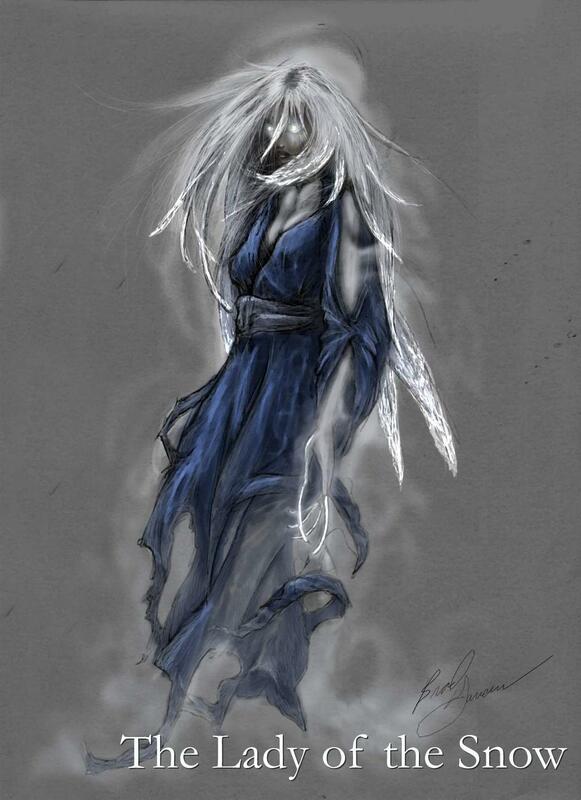 The Ninja player will master many deadly arts that include Smoke Bomb, which they use to make themselves disappear. By using Animal Form, Ninjas can turn into seemingly harmless creatures like wolves and serpents, allowing them to move freely among their enemies. 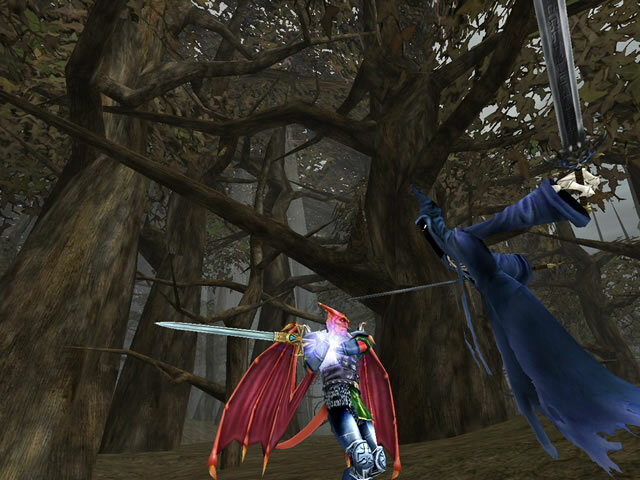 With the Mirror Image skill, Ninjas can confuse their enemies by creating up to four mirror images of themselves. The game is scheduled to be complete in November and will retail for about $29.99 in the US. You can find the press release here. Slashdot also has some discussions on the new project. 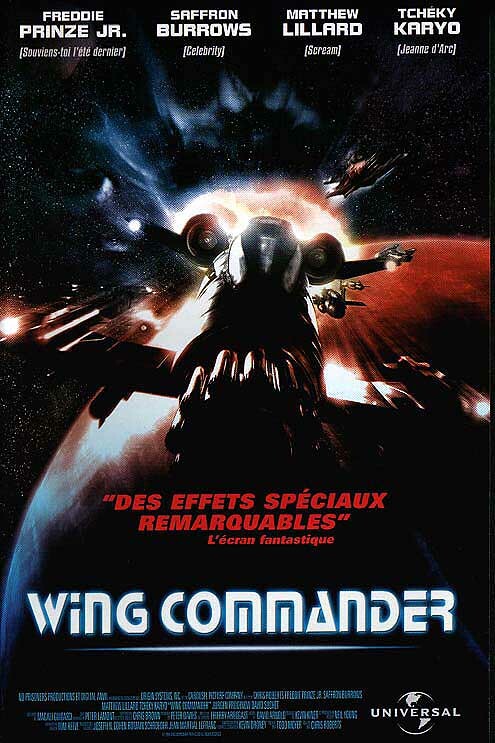 The Wing Commander movie will be showing on the Sci-Fi Channel in the US again this Saturday. It will go on the air at 12:30 pm Eastern/Pacific. That's shortly after noon for those confused by the am/pm. Freespace License. What if... ....Derek Smart, yeah, that would be me, got the license from my friends at Interplay (a publisher I had very good experiences with); would you buy Freespace 3 if I made it? Discuss. Rave. Rant. Argue. But this is something I am seriously considering, given that it looks like Interplay has started off loading properties (starting with Fallout3). I mean, just think. Would you rather see this legacy license fall into the wrong hands? But hey, its either me or it dies. No two ways about it really. 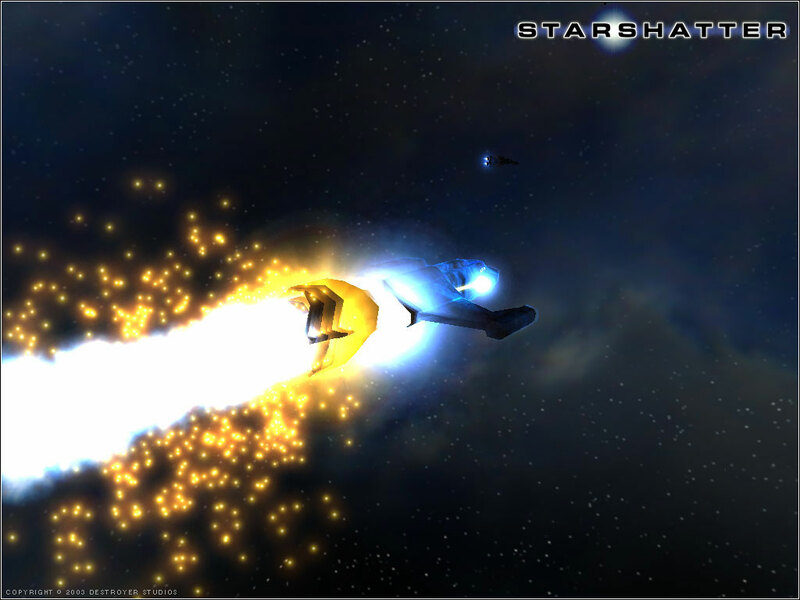 And unless you are a die hard space sim fan, this [Freespace 3 game] shouldn't concern you in the very least I don't think. So far, three people have voted that I shouldn't touch it. Makes no difference to me really as I still get to make the games I want to make, regardless. I'm not here to win any hearts, blow any minds, organize cookouts, take long walks in the park or pass around the walm milk. 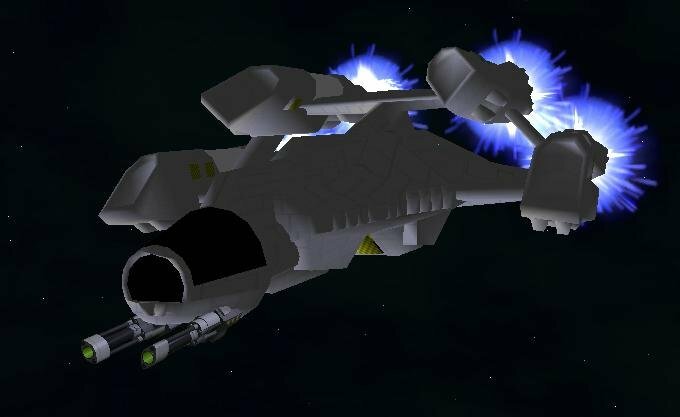 All I want to say it if anyone has played ANY of my games, not to mention the recently released Universal Combat, it should be clearly apparent that you're not dealing with some fly-by-night developer of a mod crew thats going to disappear overnight. Let me assure you of one thing that you can go to sleep with tonite. I have FULL intentions of getting this license. If I DO get it, you and your teenny leetle friends on your Ferrous Oxide project, are effectively, shutdown because I don't piss around when it comes to IP properties. You would do well to ask around. I've sued publishers for less and I have attorneys around the world, literally on speed dial. Now, I will leave you with that thought, as I retired for the evening. You will eventually come to regret this day. Mark my words. If I get it, I'm going to develop this game. NO amount of crying, magic, spellcasting, running outside naked and yelling or coming to my house with +2 Armor of God and +6 whupass, is going to change that. So, the ones making these crazy posts (the attention must be nice - try dating) might as well go to sleep tonight knowing that as tenacious as my reputation is, if there is ANY chance of obtaining this license, I'm going to get it. YOU insulting lot have VERY few choices and options. You are either going to be a part of the end result or you remain a part of the problem that will let this legacy and much regarded franchise die with Freespace2. Think about this. It makes NO difference to me. I CONSISTENTLY develop, publish and sell games. So, its not like I don't have a project (considering that I have no less than THREE in development right this minute) to fund and develop. We've had our own run ins with Mister Doctor Smart over the years and have complete sympathy for people arguing with him. LOAF has written an open letter to Freespace fans at Crius. Sorry if this seems weird to you. Information on the Derek Smart Phenomenon can be found here. Mr. Smart's biggest folly is that he participates in the flame war. This is what has made the flame war so popular, so entertaining, so persistent, and so long lasting. It is amazing that a game developer will frequently and consistently insult his customers and his potential customers on-line in a game news group. The flame war has become like a large soap opera. In the flame war there's even been a day, August 22, that has been dubbed Derek Smart Says F-ck You Day. This day is to commemorate Mr. Smart's unique style in public relations. 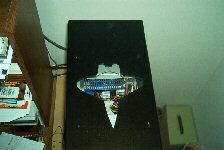 Vega Strike, as you may know, can use vweps. ie the guns on your ship look like they should. 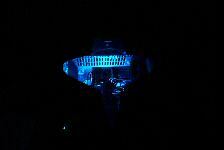 If you have lasers, you will see lasers in the external view. If you have plasma, you'll see plasma. Same with the other ships. 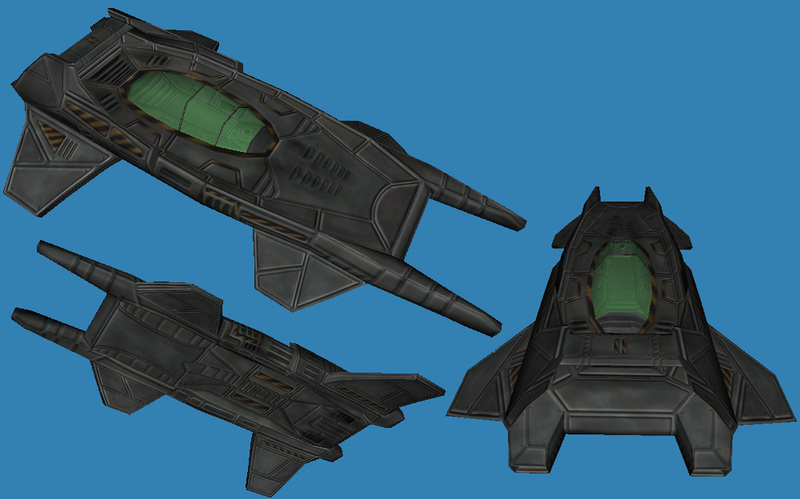 Scheherezade has come up with some great models for the Privateer weapons. 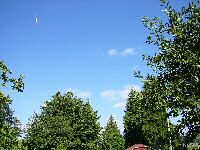 Attached is a pic of an Orion mounting a couple Tachyons flying past Perry Naval Base. 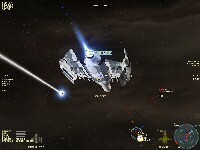 This shot is of a Galaxy sporting Mass Drivers. The texture on the Galaxy is better than the Orion (wasn't me that did it) but the lighting doesn't show it too well. That's ok though, this pic is about the guns. When we first looked at this game back in April, it was already shaping up to be a great looking game. Featuring atmospheric flight as well as space flight, along with a strategy element as well, it combines features bound to appeal to a lot of WC fans. Now the game has been released, and if you don't want to head to a store you can even buy the game online and download it straight away. It also looks like some WC fans are already interested in modding the game. You can find out more on the Starshatter site. Wow, it was nearly six years ago that I sat down and put together the original Secret Ops guide. Looking back at it now, it was pretty horrible. The MS Word version I later made was much better. Then it got converted to a PDF file, and now courtesy of Shades we present to you the latest and greatest version. It has neat little tweaks like bookmarks, a unified mission titles format, and apparently there was an error in the missions flowchart. You can download this updated version here. What's this? HTL on a Wednesday? How odd. Well, we didn't want to keep you all waiting for this latest chapter. Here's Raptor. Okay, I think that enough of the curtain raisers, and time for the main event to start. 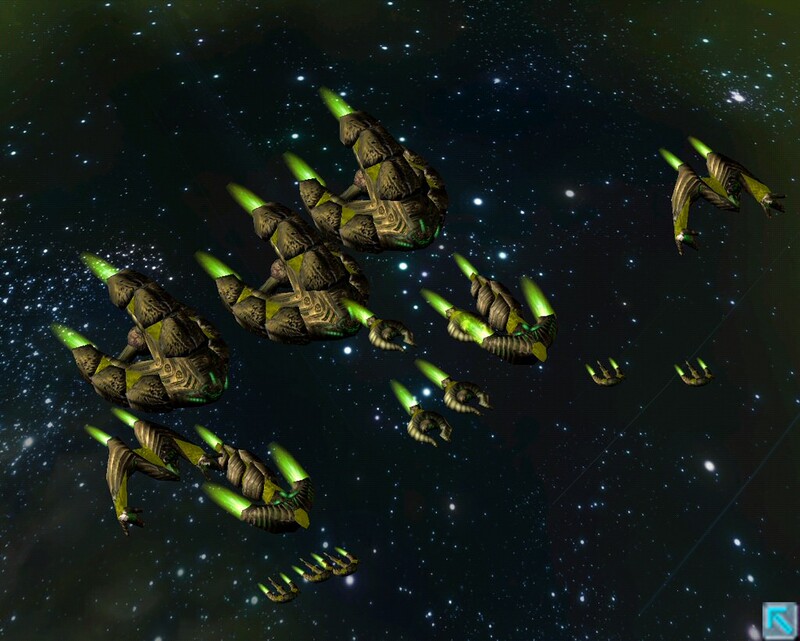 The Nephilim are coming in fast, eager to finish off the battle once and for all, and Combined Fleet is ready to take that massive armada on. We commence the big and bloody finale battle in earnest with a great four parter called "Loud And Clear." It's jointly written by Joe "Wraith" Guida (whose TCS Yorktown battlegroup will be at the centre of this battle), the Battle Group Auria writing team, and Shaun Rashid of the TCS Endeavour. Please send any and all comments to Joe at captpowell1@earthlink.net, and he'll pass them along to his fellow writers. 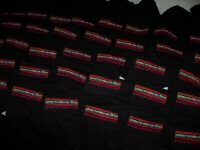 I'll probably be doing a supply restock on CIC Polo Shirts in a day or two, and there's a possibility that we could do a few custom names on the sleeves again. If this is something you're interested in, email me immediately to make sure you get in on the order. 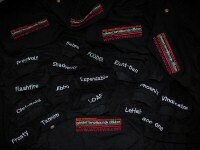 The shirts are $20, including shipping in the US. 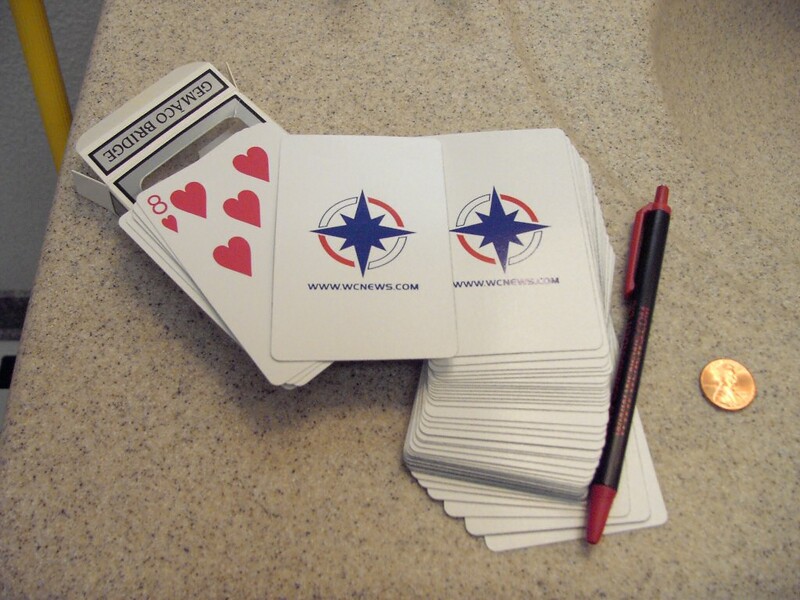 Overseas shipping adds $5 and custom names add $3. If you were thinking about getting a shirt without a name, now's a good time for that too so I can order more efficient amounts. We're also once again trying to hammer out some hat details. You can help us make some decisions on that project at Crius here. Questions for Week 2 in our summer trivia game are now available. You can email the answers to TC or fill out our form here. Because of the email glitch, Week 1 answers can also be emailed this week, so don't miss out of your chance to play. The scoreboard and previous answers will go up beginning with Week 3. Just a tiny update here. Public progress updates for the Standoff mod had slowed in recent months, and a few people had been asking us questions. 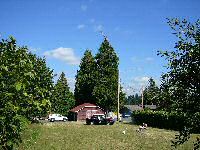 The Standoff news area has been updated to let everyone know work has continued steadily. You can check their updated Progress area to see specifically where the project stands now. Work on all other fronts has continued, and the progress page has finally been updated to reflect the current state of the project. 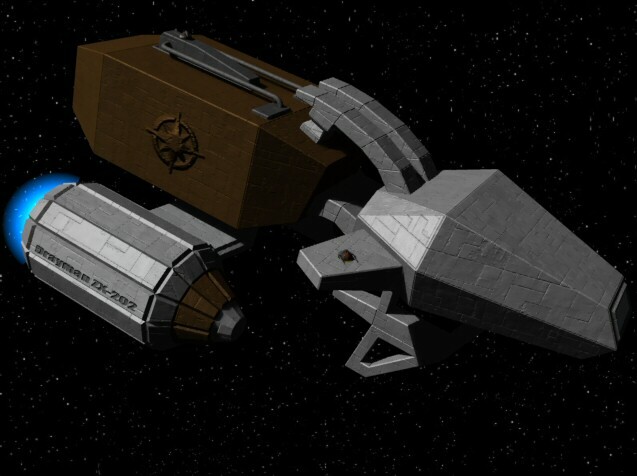 Quarto has finished off the remaining missions for the prologue and is now working on the last cutscenes. Tango has been working on sim missions, and Tempest made lots of progress with voiceovers (although they're still a long way from not being our main concern :-P). Dishwasher has put out a progress update for the WC Unreal Mod. In the first shot below you can see some Hellcats on a flight deck. He has begun trying out some textures on them, but for now their placeholder bodies are available to see. It should be fun to run around a ship like that. You can provide feedback at Crius here or visit Dishwasher's personal site. 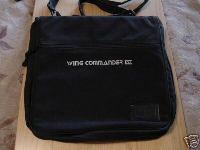 The exclusive Wing Commander items being auctioned off by former Origin developer Tony Morone are ending tomorrow. If you haven't been following them, you've got a little time left to check out the items and bid. TC has scored the submissions to this week's trivia game, but there was a glitch in some of the email submissions. If you have not received an email acknowledging receipt of your answers, you should send them in immediately. New questions will be posted tomorrow, though we're giving you an extra day or two to resubmit your answers because of the problem. 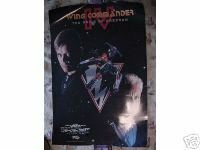 Production of the Wing Commander series has been blessed with a few wonderful musicians over the years. Even better, with all the work they do in the game, movie and entertainment industries, they consistently have a special place in their heart for Wing Commander fans. 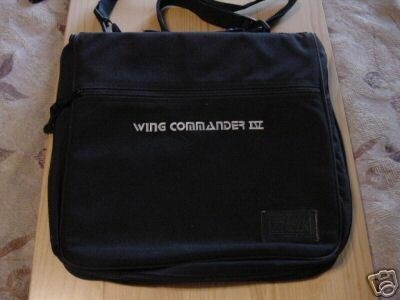 Wing Commander 3, 4 & Prophecy composer George Oldziey's official site is currently being upgraded and overhauled, and the new layout will feature a prominent Wing Commander section. There is already a nice biography online and musical samples from Wing Commanders 3 & 4 and some of his other projects are up. Mr. Oldziey is also interested in hearing what fans would like to see in the other sections of his site. Some possibilities include rearranging and updating original WC3/4/Prophecy pieces. 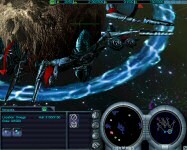 In 1994, George became an in-house composer for Origin Systems in Austin, for whom he composed music for some of the biggest hits in the computer game industry, including the "Wing Commander", "Crusader" and "Ultima" series. After four years at Origin, George left to start George Oldziey Music, Inc. and continued to compose and produce music for other games, including the Playstation 2 version of "Spongebob Squarepants" in 2002. Since then, George has served as an orchestrator, score producer and contributing composer for the Robert Rodriguez films "Spy Kids 2", "Spy Kids 3", and "Once Upon a Time in Mexico". His most recent film credit in that capacity is Quentin Tarantino's "Kill Bill, vol. 2". You can find his developing site here. Way back in September 1998 we recorded a special George Oldziey interview. You can find it in episode two of the CIC Infoburst, our old Real Audio show. Daniel Brito has recently started using SQL Navigator. He noticed something familiar about the program's logo. 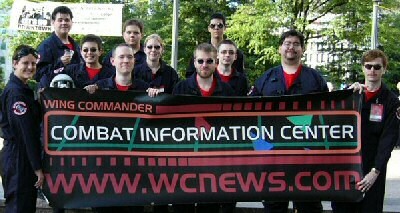 We're just one month away from our August 10 anniversary at wcnews.com. This year's birthday will be on a Tuesday evening in North/South America and early Wednesday for those in East Europe to Australia. If this is a new event for you, our annual birthday parties are held online on irc in #Wingnut. Details on joining can be found in our irc section here. Feel free to stop by any time to get situated or hang out. We officially start the party on August 10 at 7:00 pm Eastern US time (4:00 pm Pacific and 11:00 pm GMT). A one hour countdown begins to where we will be unveiling a number of exclusive Wing Commander features we've been able to assemble this year. Several separate fan projects and groups have said they'd like to contribute something to coincide with the event as well. We'll be handing out a variety of prizes, announcing the winners of our trivia contest and answering last minute questions about DragonCon too. We'll have a tentative list of prizes up soon. Hope to see you there! American WC fans have already had their chance to meet John Rhys-Davies, better known as Paladin, at DragonCon a few years ago. Now Australian fans have a chance to do the same! 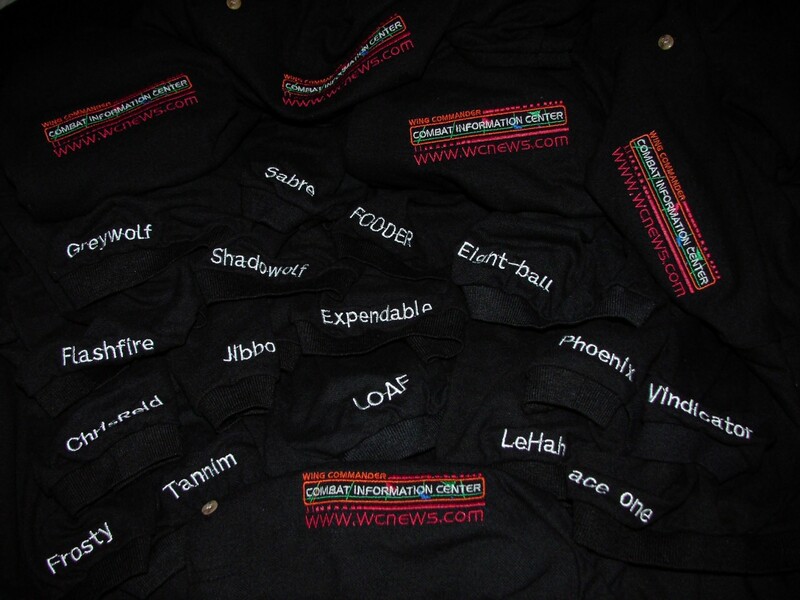 TheOneRing.net reports that Paladin will be attending the FSF convention in Sydney on September 11, 2004. It's a great chance to attack him with copies of WC3 and WC4. Again. 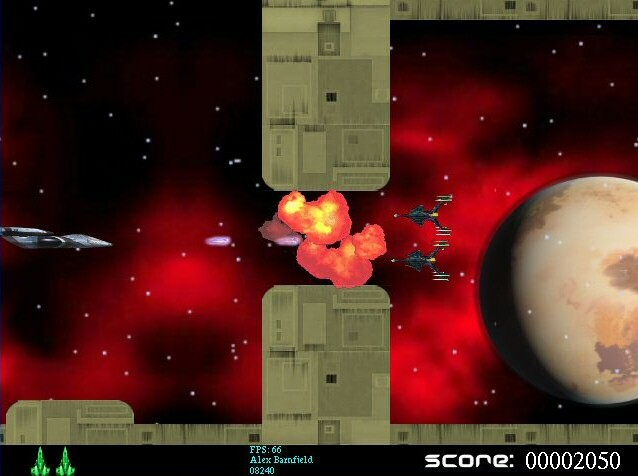 Jay Barnson and Rampant Games are currently producing a new space combat sim that draws a lot from past Wing Commander experiences and should include some exciting action. Void War has a single player game with a compelling storyline, but a lot of attention has been paid to large multiplayer battles. 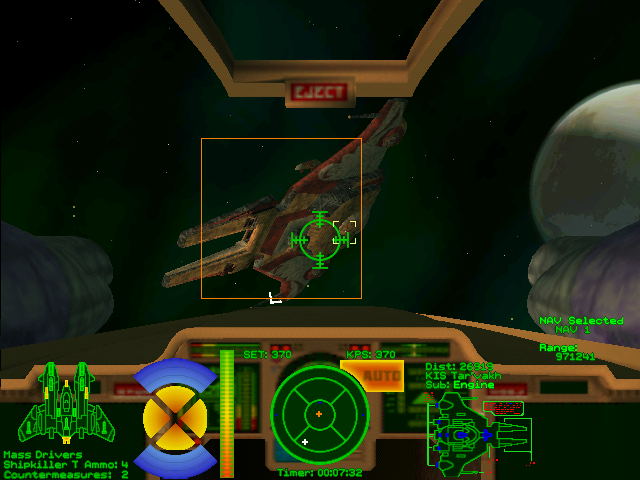 Although the game engine has been loosely based on Wing Commander, inertial concerns and physics mechanics have an influence on the craft and alter flying to a certain degree. 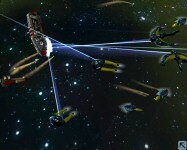 The multiplayer areas are rich with asteroids, planets, space stations and other debris to spice up the environment. 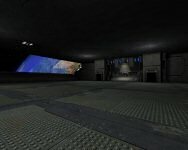 Teams or individual players can fight for dominance in these arenas. They hope to support up to 32 players. 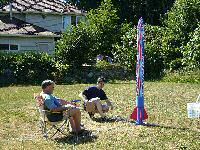 Mr. Barnson is a huge Wing Commander fan and cares about the space sim genre quite a bit. 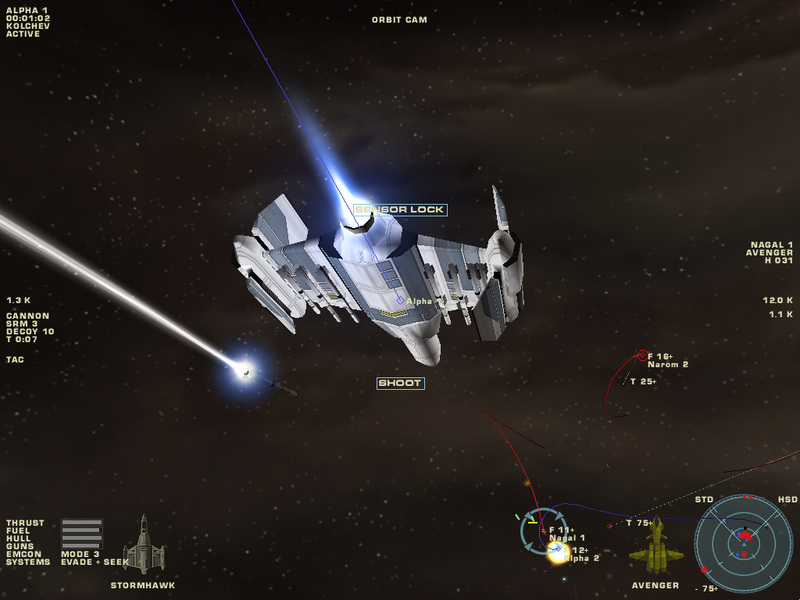 Void War will attempt to add features to the space landscape so that it is not always as lifeless as the real thing can be. The Rampart team is frantically working to get into beta at the moment, but we hope to arrange a drawing for a few copies of the game when things solidify a bit. Here are a few sample screenshots. Some of the ships remind me somewhat of Subspace designs. Hopefully the team's enthusiasm translates into some fun multiplayer adventures for us together. 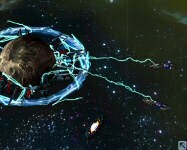 You can find out more at the Void War site here. We were a little worried when Hades didn't show up on irc today. Kris finally found him thanks to the BBC Website. Hopefully we can clear up this misunderstanding so he can get back to work soon. 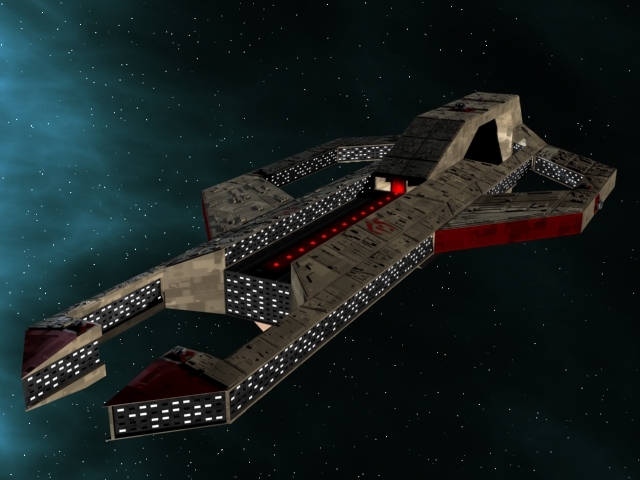 Zohrath has wrapped up the Fralthi II Cruiser design that he has been working on this year. The final version is pretty great. 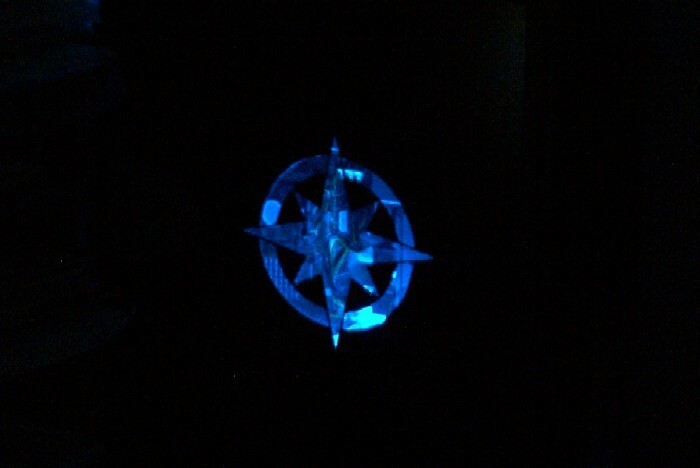 He originally started showing off the model in February and will be moving on to the Excalibur next. Wouldn't you love to have that as a giant painting on your wall? You can download the model here or here. Check out Zohrath's 3D site to find more. Prophecy Advance developer Raylight has announced their next game, Smashing Drive for the GBA. The game began as an arcade driving game by Namco and was ported to the XBox and GameCube a couple years back. By utilizing Raylight's revolutionary 3D talents, Smashing Drive will be the first GBA game to full 3D environments and cars working together. The cars will model realistic damage, and the items in the cities will be manipulated as you drive through them. 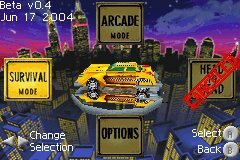 If you're unfamiliar with the series, it's sort of a hyped up Crazy Taxi crossed with Wreckless. 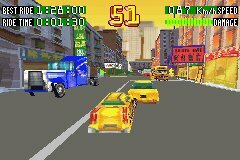 You're in the cab and have to deliver passengers all around New York City, using all kinds of daring driving maneuvers and assorted power-ups. You compete against an AI driver or a buddy. So you may be racing to reach Little Italy or Wall Street and other cool areas in NYC. To help you in the traffic that can be found on the streets, there are several power-ups along the way. The power-ups include the Cutter, Sonic Blast, Glider, Turbo, 4x4, Repair and Crash. There are also shortcuts along the way to add more fun to the experience. Most of the time you will need to use shortcuts to find the cool power-ups and you'll need certain power-ups to access certain shortcuts. 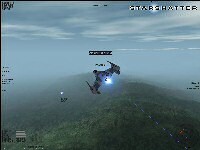 The game supports two person multiplayer. It should be another great technological benchmark for the Game Boy and a lot of fun. The game is tentatively set to be released around September, though an exact time is not yet set. Lately Black Lightning has been working on a Privateer 2 Danrik model for a Freelancer mod. Sometimes the P2 designs get overlooked, and they were generally pretty neat. 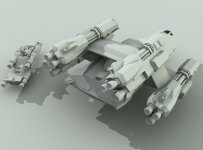 BL isn't making a WC mod, but he likes the shape of the craft. 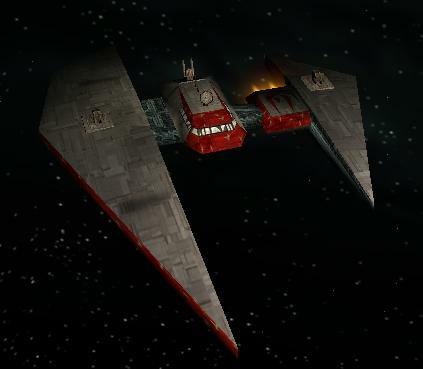 The Tri-System had some sleek and stylish fighters, and I always had fun in a Danrik. The model clocks in at just 674 triangles. That doesn't seem like very many for such a sharp creation. You can help provide feedback at Crius.net here. You can view all of the auctions here. It's now just five weeks until the CIC's Sixth Birthday, and we're holding a summer trivia game to celebrate. Because of the shorter length, there's a second bonus question each week, for a total of four questions. You can email your answers in or fill out our simple trivia form. TC is starting the game off by asking who said the following quotes. The following answers are due by next Tuesday. Question 1: "You and your grandfather have never learned the inner truth that peace and war can be one and the same, the pursuing of a policy that in the end, no matter what the means, can lead to ultimate victory. All you ever see is the path of the sword." Question 2: "You had him, too. You should have put a bullet in his head when you had the chance." Bonus 1: "I could force you to do this, but I won’t. 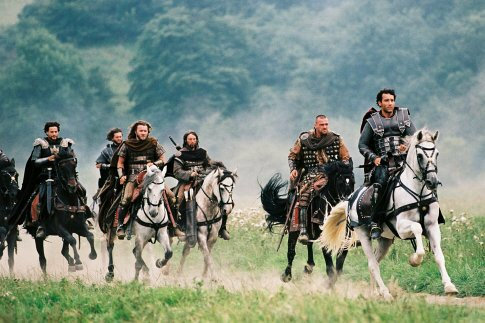 The way I see it, you can either co-operate, and let the fleet blast it to Kingdom Come... or you can keep running the rest of your life." Bonus 2: "Can I please have my clothes back, boys?" The Wing Commander inspired PC case that Castle has been working on this year is now complete. Sparing an additional light or two that might get added to brighten the thing, the case is ready to be used. 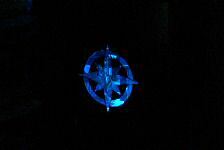 It's got a Confed star on one side and a Centurion silhouette on the top. A cool blue light makes these special fan vents stand out. We also covered beginning and middle progress updates that are pretty interesting. 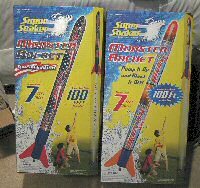 We're beginning to line up cool and exciting prizes for the CIC Birthday next month, and we found one that would also make a great prize for a summer trivia game. TC will be putting together an abbreviated game this summer, and we hope to make it a little bit interesting to compensate for the shorter schedule. It will continue throughout this month and on until August 10, the CIC's Sixth Birthday. So start your studying, the game begins very soon. 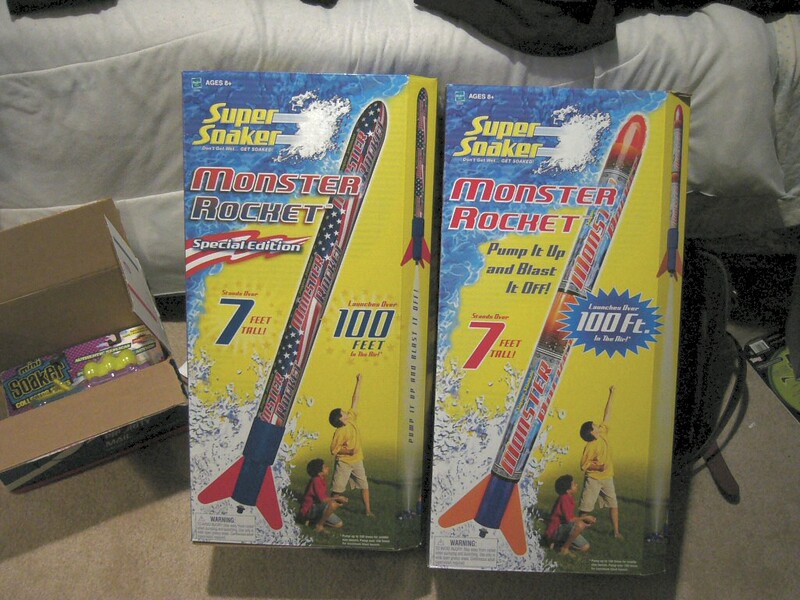 The Super Soaker Rocket turned out to be pretty great, so I had to share a couple pictures. We actually couldn't get the launcher to work quite right, so we had to manually trigger it up close. It gets up to 100-150 feet on a full charge. Happy Fourth of July to everyone around the world. 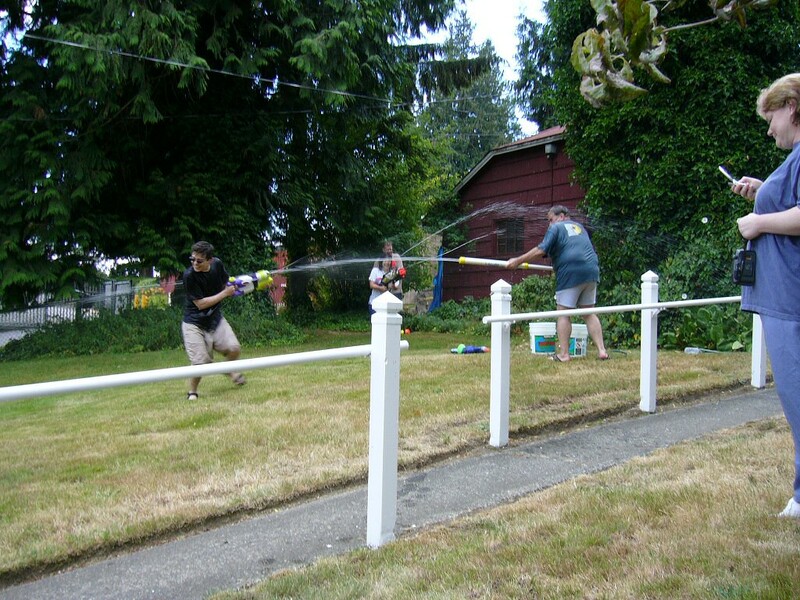 If it's not Independence Day for you, at least grab some Super Soakers and have some fun. That's what I'll be doing. Theunis Dijkman has sent in a frame of a potential Wing Commander comic he is working on. He would appreciate some constructive criticism and feedback to help him potentially smooth out the piece and release some more. Click on the "discuss" link below this update and tell him what you think. 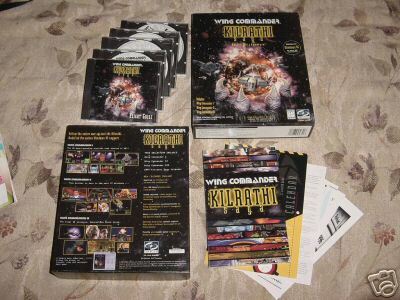 Last year we reported about ReplacementDocs hosting a variety scans for Wing Commander game manuals. Unfortunately, earlier this year a malicious hacker broke into their site and wiped their server. They are recovering some of their material now, and in the mean time, downloads are suspended. 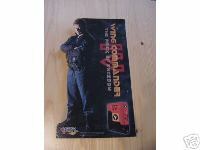 So we're mirroring the Wing Commander related manuals for people to enjoy. Other documentation is also online! And don't forget that we have a full list of game controls available here. 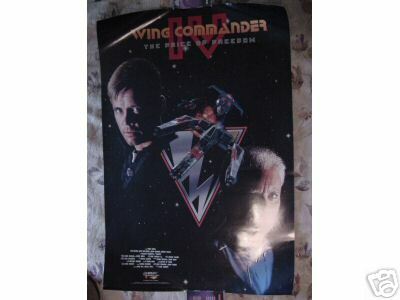 We like to sometimes mention WC items that are so rare, most people will have never seen one, and since LOAF just bought a Freedom Flight poster on eBay, we figured that would be a good one to cover. 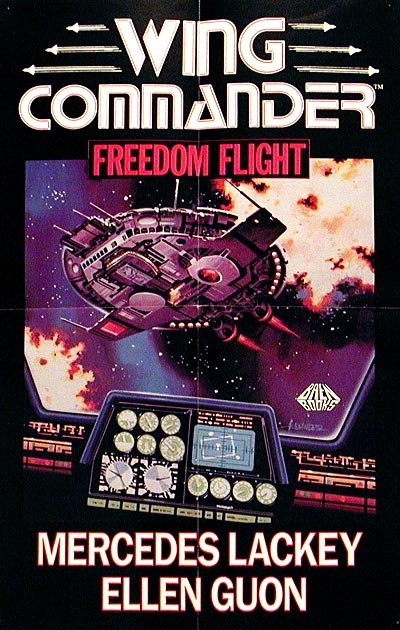 It was produced in 1992 by Baen to promote the Freedom Flight novel. 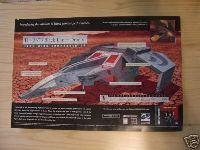 Baen weren't able to tell us anything about the poster, but we do know that there was also a poster to promote End Run. The reverse of this one apparently contains novel details ad promotional plans. Wouldn't this look great hanging on your wall next to the almost equally rare WC3/4 Zanart and the also rare WC movie Blair and Maniac posters? 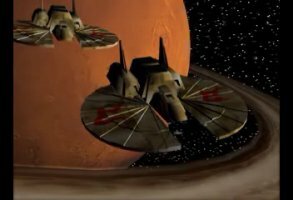 Expert artist Howie Day has combined his gorgeous Hornet and Dralthi to reproduce the beginning of the Wing Commander 1 intro. There are a couple screenshots below, but if you've seen any of his previous work, you know you should check this out. 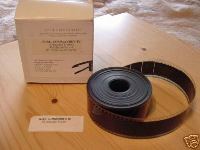 It's a 5.8 meg divx that you can grab here. DragonCon 2004 is now only two months away! Boy, this year has gone fast. In just eight short weeks we will be holding our annual fan gathering in Atlanta to celebrate Wing Commander and have fun at the world's largest science fiction and fantasy convention. We've gotten a couple questions recently, so I'll highlight some of the main points again here. Four-day passes to the convention will be $70 until July 15. If you know you're attending, preorder your pass to save a few bucks at the door. Hotels usually range from $150-200 per person for a four night stay. If you're rooming with us, the hotels have already been prebooked for the CIC. Air fare in the US ranges from $200-400 most likely. Sound expensive? Hades spends about $2000 each year to attend, but you can get by much cheaper if you are creative with your transportation options. DragonCon is always tons of fun, so if you have any questions at all about attending, don't hesitate to email us or visit the Crius DragonCon Zone. "Development on Ultima X: Odyssey Has Ended"
Electronic Arts has suspended development on Ultima X Odyssey, the massively multiplayer adventure set to continue the Ultima series. It's always something of a shock when a game is canceled after a large time and resource investment, but several factors may have hindered the game of late. The game's development had recently be transferred from the shuttered Origin Austin studio to EA Redwood Shores, and anticipated beta and release dates were slipping. The producer of the game had this to say. This isn't an easy decision but it’s the right move for the future of all things Ultima, including the community and the team. We look forward to sharing our plans for the future of Ultima Online very soon. 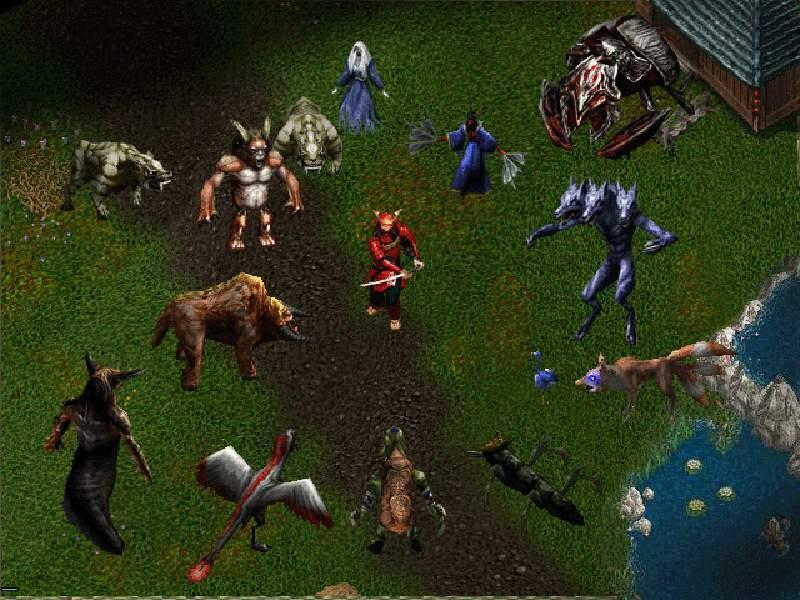 It's good to hear Ultima Online is still going strong, but how many games are they going to cancel to support it? They're working on an as-yet-unannounced Ultima Online spin-off already. Hopefully it'll actually be released someday. 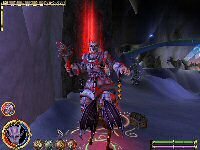 It's always sad when a game is canceled, but the Ultima franchise seems to be quite strong yet. I look forward to seeing what they plan to do. It's been only one year since they first announced Ultima X, and obviously, a lot can happen in a year. Here's some proof that at one time it really did exist. We'll be here when they announce the next one. Stay tuned. 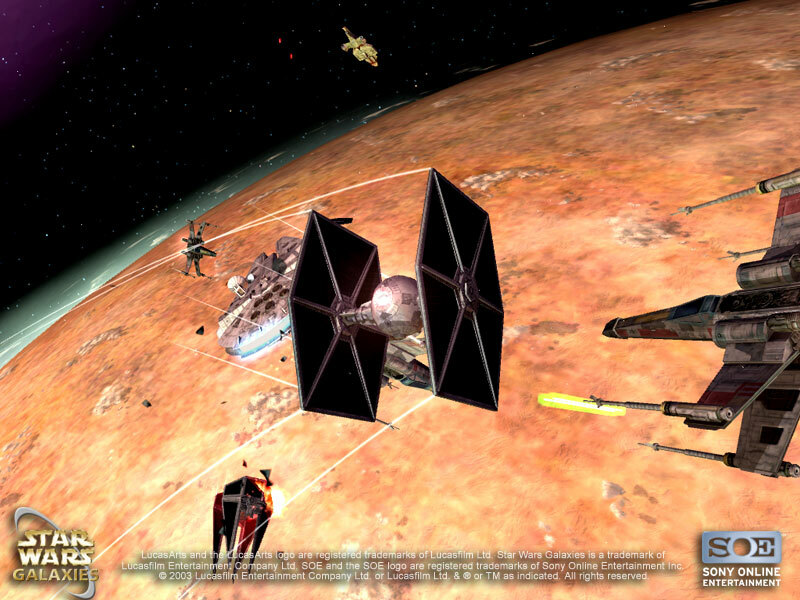 In more positive news, Star Wars Galaxies has reached its first birthday and seems to be doing rather well. 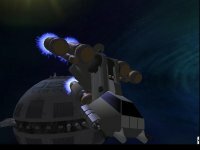 The developers have put up an anniversary site with information on the progress the game has made. There's a neat timeline as well. As this game has been developed in Verant Austin, a couple dozen former Origin employees have taken part. 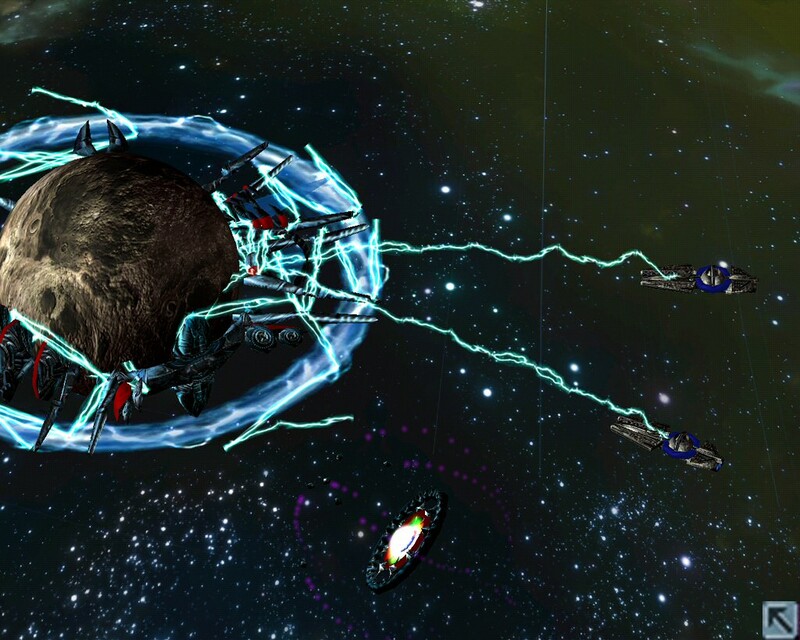 The space sim expansion, Jump to Lightspeed, is due out this fall. Here's some new screenshots.